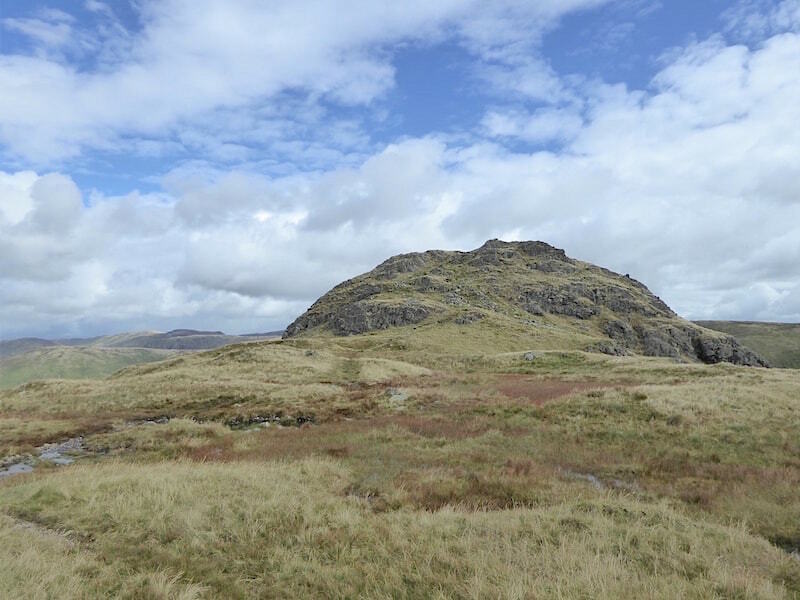 We haven’t really had the opportunity or the weather to be out on the fells for the past week or so but as the weather looked set to be reasonable today, with far fewer showers and low cloud than of late, we thought we’d take a walk up to Dove Crag via the Dovedale route. 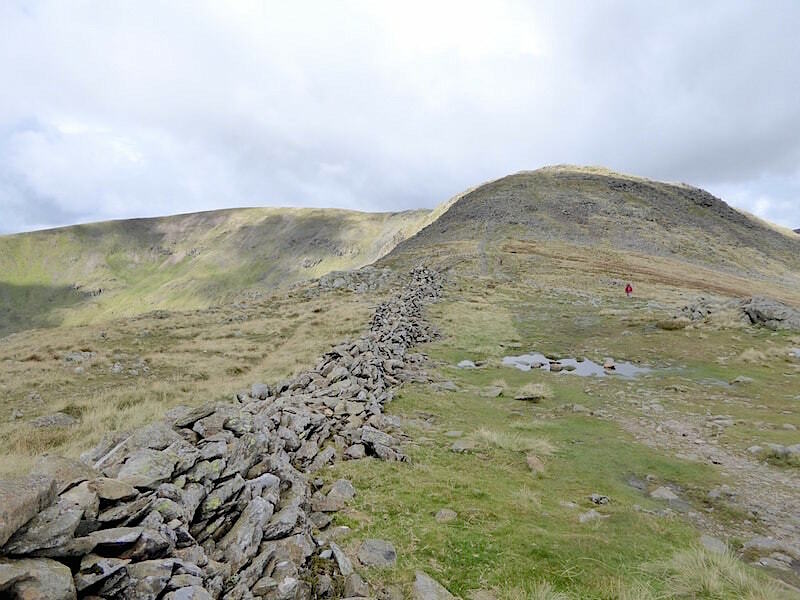 Its a long, steep and strenuous ascent, especially in the latter stages, but it does afford the opportunity to get up close and personal with the eastern face of the fell which would otherwise be difficult to experience from the more widely used approaches to the summit. 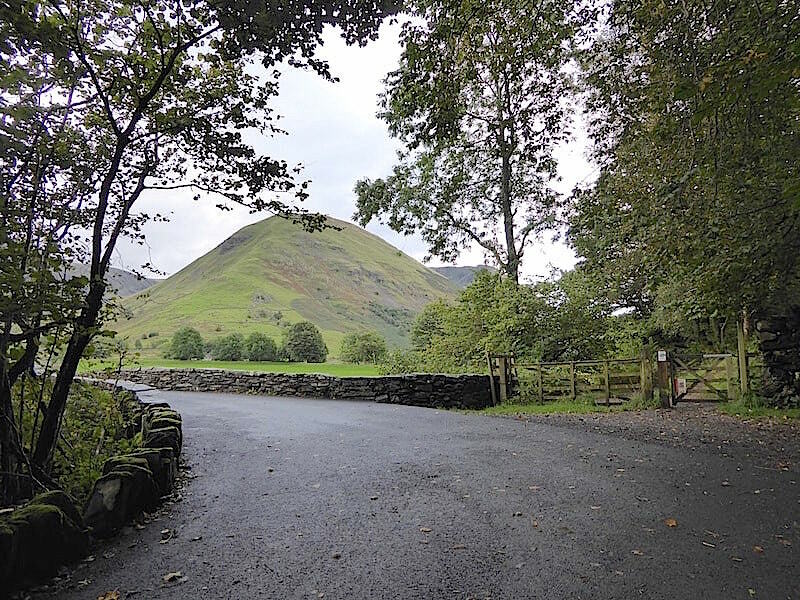 Hartsop Dodd from the Cow Bridge car park. Two young men were already parked and ready to go as we arrived and after exchanging ‘Good mornings’ with us their car boot was slammed shut and off they went. 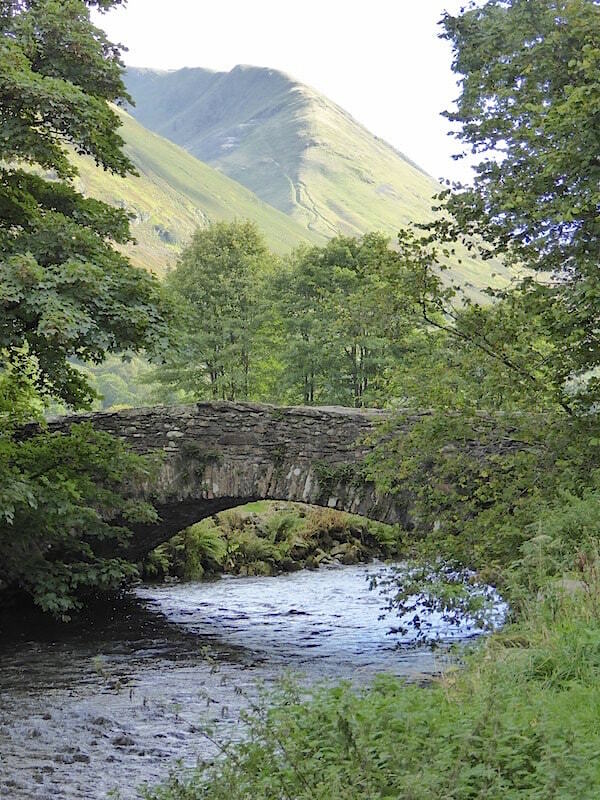 I was busy getting myself organised so I didn’t see which direction they took, possibly over the bridge to Hartsop village as I didn’t see them anywhere ahead of us on the route we followed. 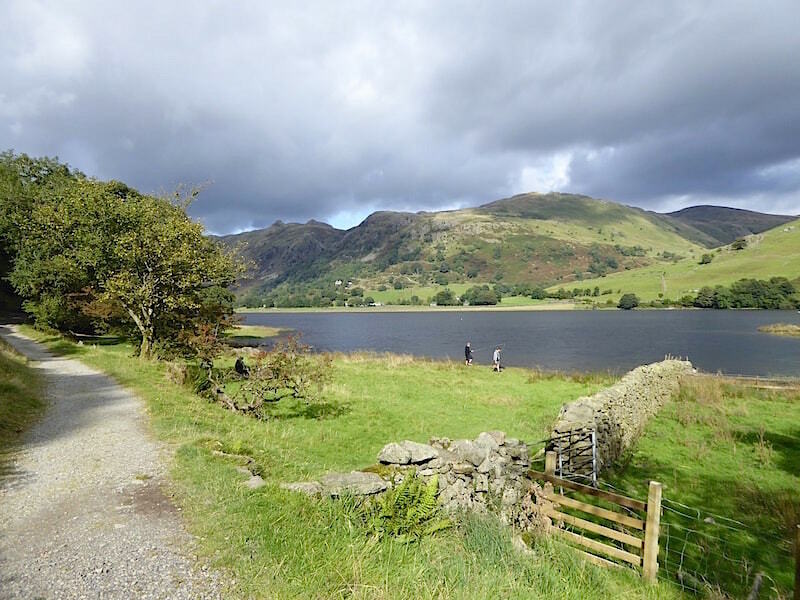 After kitting up we walked to the southern end of the car park where the gate gives access to a path running alongside Brothers Water to Hartsop Hall and Dovedale. Things are a bit grey and damp at the moment so we’re hoping things will pick up as the day progresses. 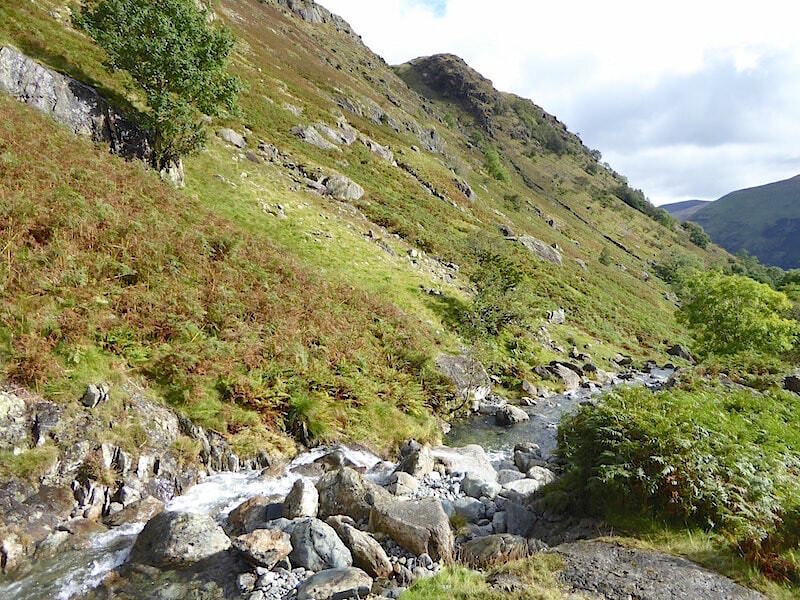 From the path alongside Brothers Water we look over to Hartsop Dodd with Gray Crag behind it on the left and Caudale Moor behind it to the right. There’s no-one around apart from a couple of dog walkers. Beyond Brothers Water now and looking up the Kirkstone Pass with Caudale Moor on the left and Middle Dodd and Red Screes to the right, and blue sky appearing overhead. 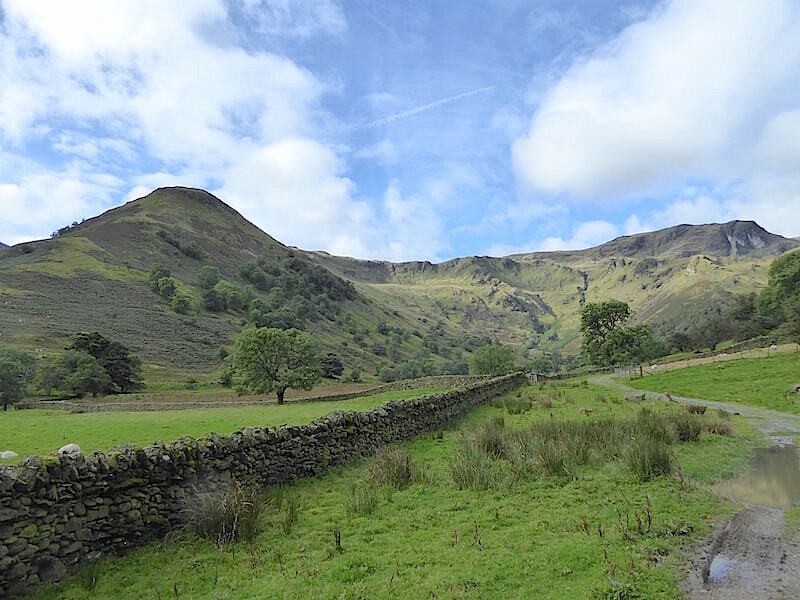 Hartsop Hall, where the main path from the car park now diverges and there are three routes to choose from, two of the paths will lead into Dovedale and the other will take you eastwards across the fields towards the Kirkstone Pass and the Scandale Pass via Caiston Glen. 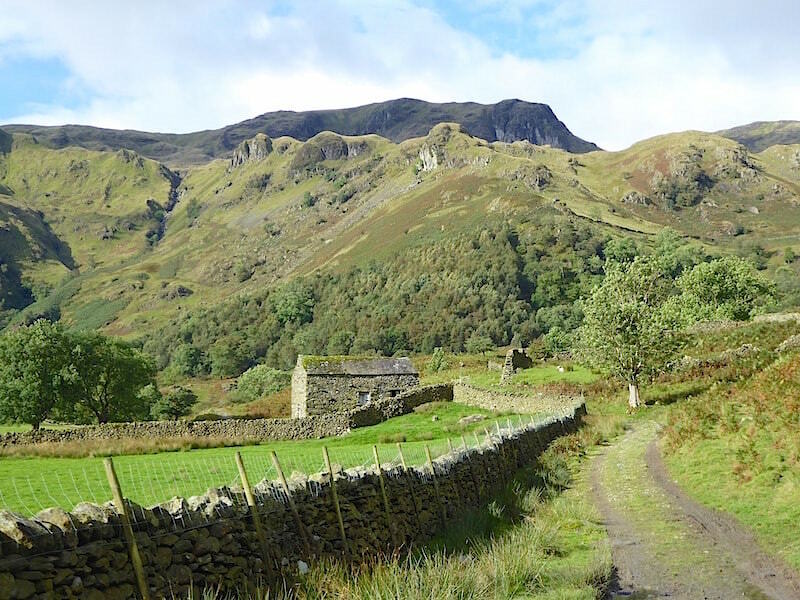 Of the two routes into Dovedale, one follows a path rising toward the old Hartsop Hall lead mine which hugs the fell sides of Hartsop above How on the north side of the valley, and the other travels around the base of Stangs alongside Dovedale Beck and its waterfalls. 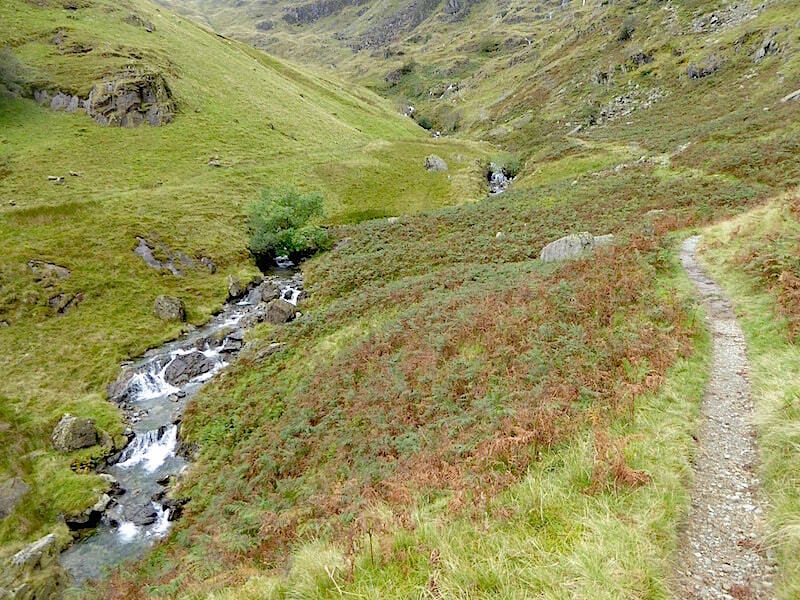 We chose the latter and continued along to the footbridge at the end of the valley. 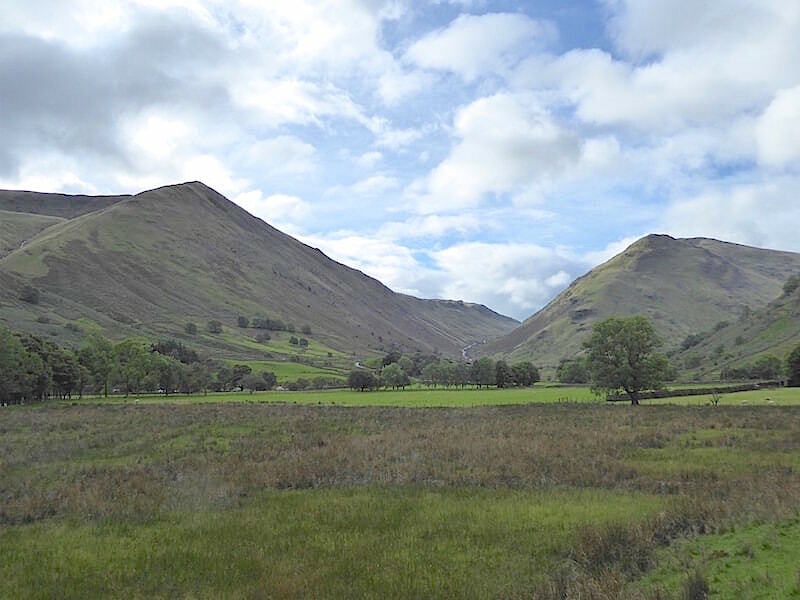 This is flat and easy walking with views of Dove Crag on the right and the long sweep over to High Hartsop Dodd, with the two tops of Little Hart Crag just behind it, on the left. That’s our route for today. 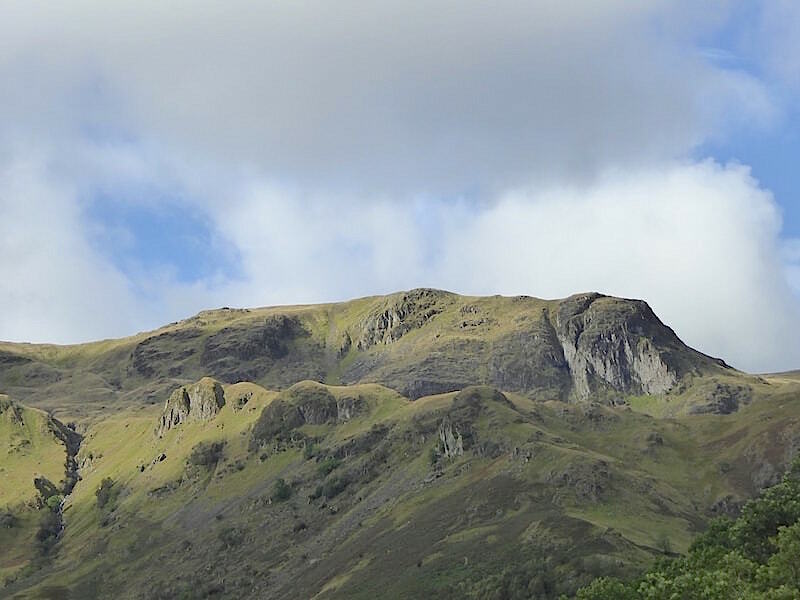 A closer look at a sunlit Dove Crag with Stand Crags just below it. Nearing the the old barn at the end of the lovely, apart from the very wet path, valley section of the walk. 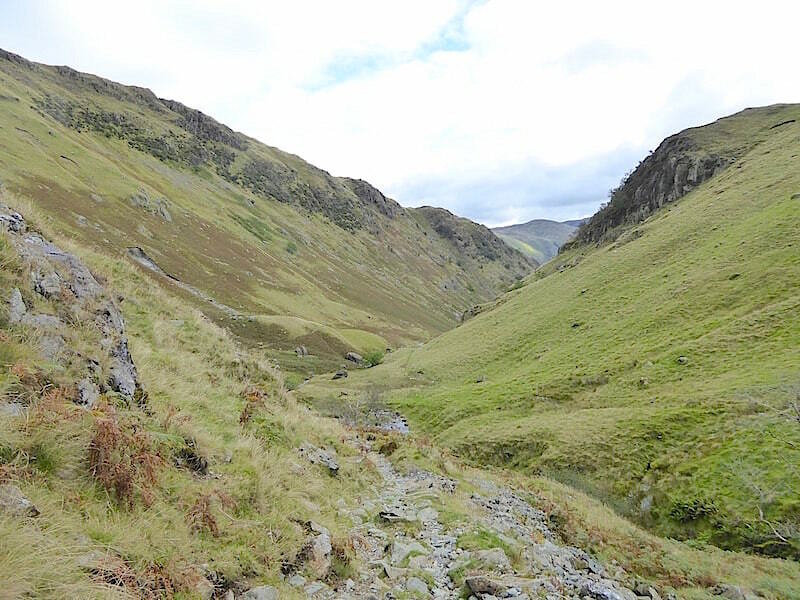 At the end of the valley where Hogget Gill comes in from the left and joins forces with Dovedale Beck. Hogget Gill rises in Hunsett Cove which is just below the skyline in the centre of the shot. 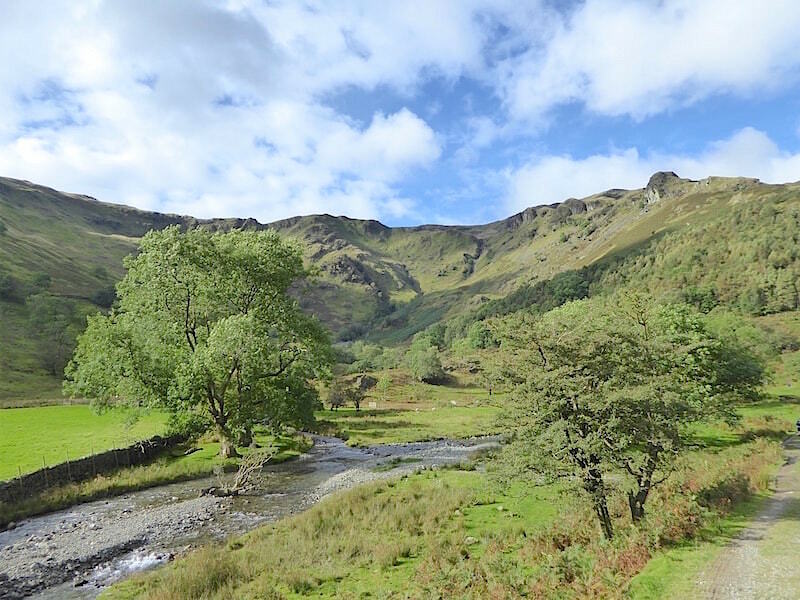 The path follows the curve of Dovedale Beck around to the right …..
….. where a footbridge across the beck awaits us. The flat and easy walking now comes to an end and the next section of the path leads us up through the still tall bracken over some very wet, muddy and slippery paths. In places it was hard work just keeping your footing and staying upright so the walking poles came into service. Even with them it was tricky at times. Out of shot to the right were two National Park vehicles and as we crossed the bridge we could see the heads and shoulders of two park workers making their way up through the bracken. 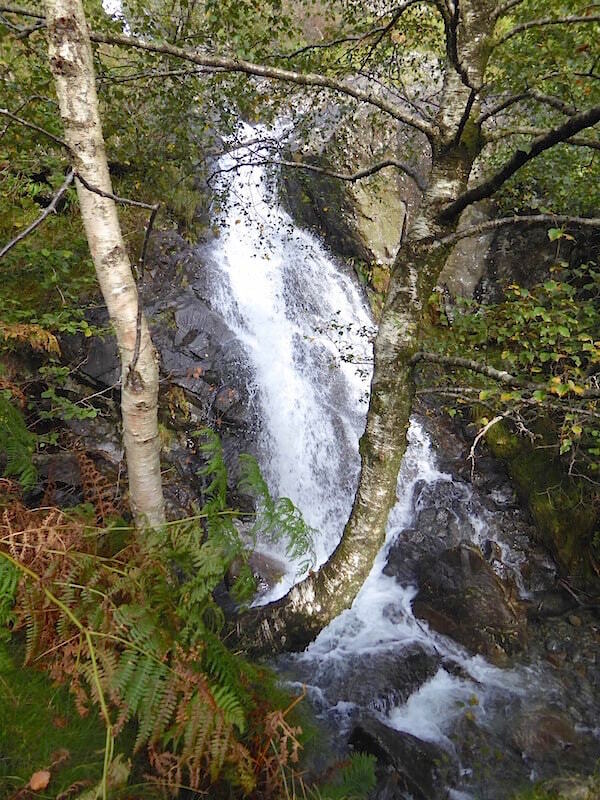 We’re safely out of the bracken but the wetness is still with us and it was difficult to find anywhere to step without sinking up to the ankles in water, mud or a combination of the two. At least the sun has put in an appearance although that was a mixed blessing since it was directly on our backs which made for warm work as we picked our way carefully though the mire. We’re in the lee of Hartsop above How too so there was nothing by way of a breeze to cool us down. We arrive at the seriously full and thunderously noisy Dove Falls by which time I was so hot I felt like hurling myself into it. A little further up the path and a higher set of falls comes into view. There’s too much vegetation at the moment but in the absence of leaves come the autumn and winter they should be quite a sight. Just beyond this point we stopped to let a group of four young lads, twenty somethings and full of energy, go by us. 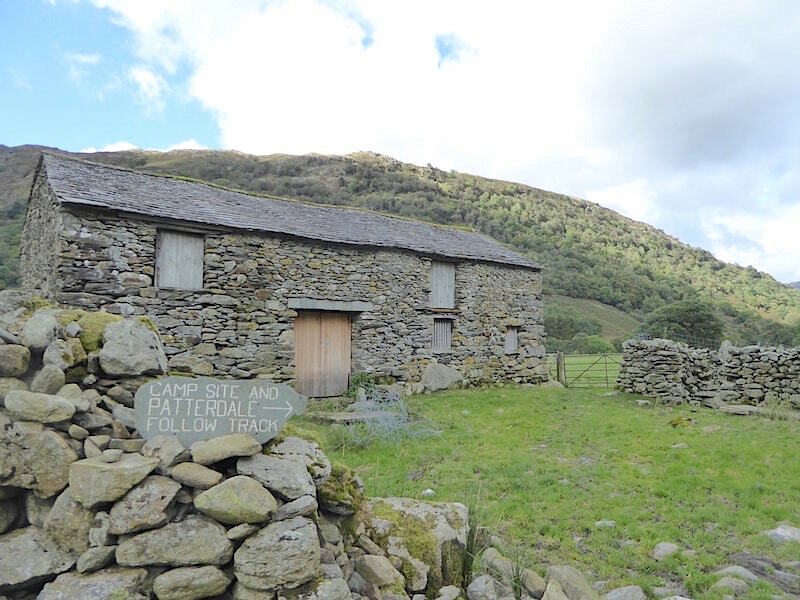 We could only wish that charging up a steep fell side wasn’t quite such a distant memory. We were to come across them again later in the walk. Above the falls now, with the path we’re following over on the bottom right of the shot. In keeping with most of the paths we walked today they were running with water. We stopped here for a few minutes to have a snack, mop the brow and give the legs a chance to recover. While we were here one of the park workers we had seen earlier came walking back down the path obviously heading back down to the vehicles we had seen parked there earlier. Its a fair way to go and get what was needed and then carry it all the way back up again. At least he didn’t need to worry about getting his feet wet, he was wearing wellies. 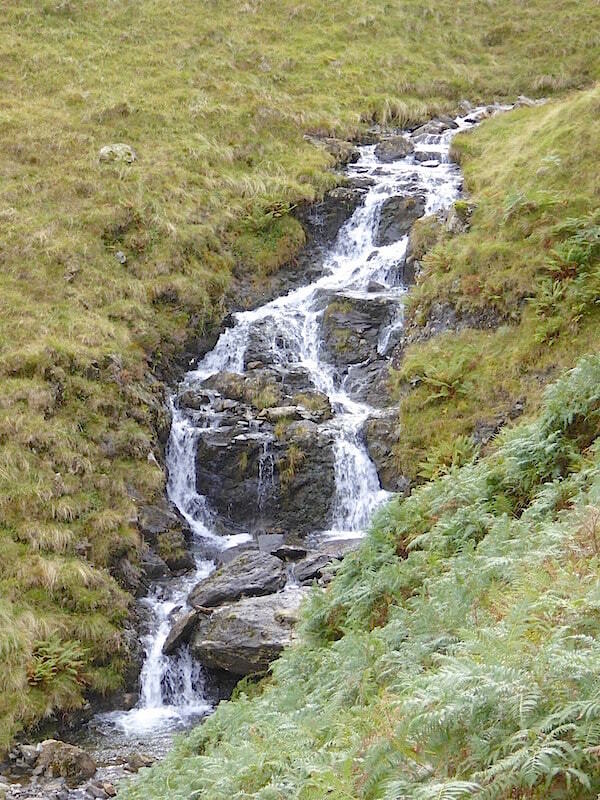 Dovedale Beck flowing along the slopes of Hartsop above How before it plunges over the falls a little lower down. 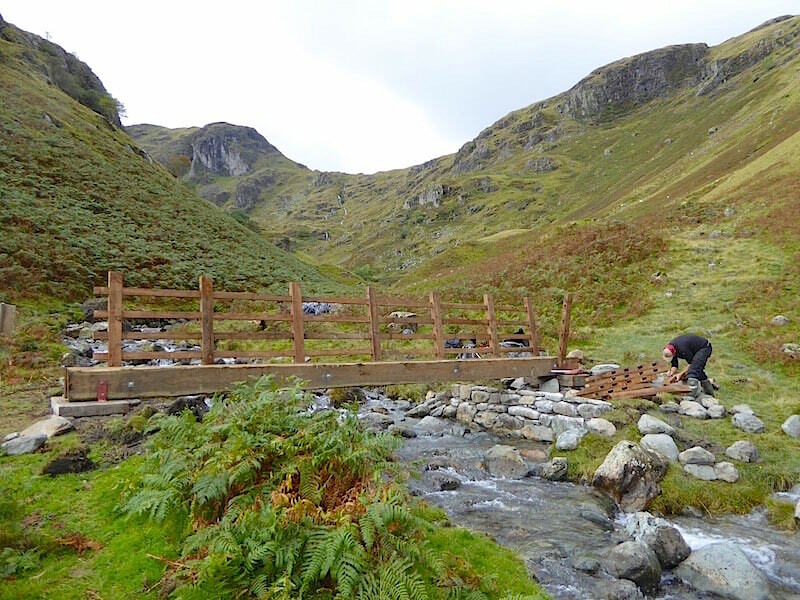 The path leads us to this crossing where one of the park workers was busy working on this replacement bridge. We had a bit of a chat with him and mentioned that we had met his mate going back down the path. He told us that they were having problems, the nuts for the bolt fixings were not the right size so the other guy had gone back down to see if they had some of the correct size in one of their vehicles. I hope they managed to find something that would fit the bill, the nearest hardware store is a long way from here. We crossed the bridge and followed the grassy path behind the workman where it joined up with the old lead mine path I mentioned earlier. 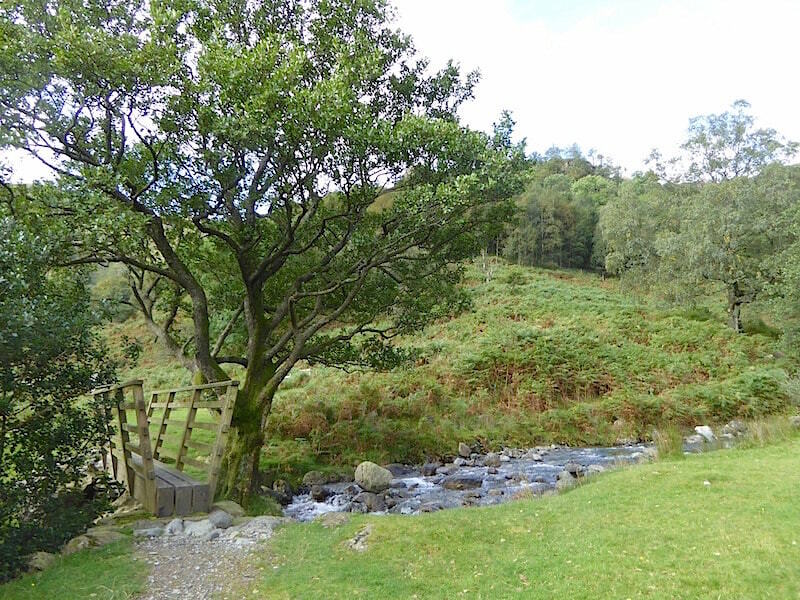 Its not necessary to cross the bridge though as there is another path on this side of the beck which you might be able to pick out running through the bracken behind the bridge. 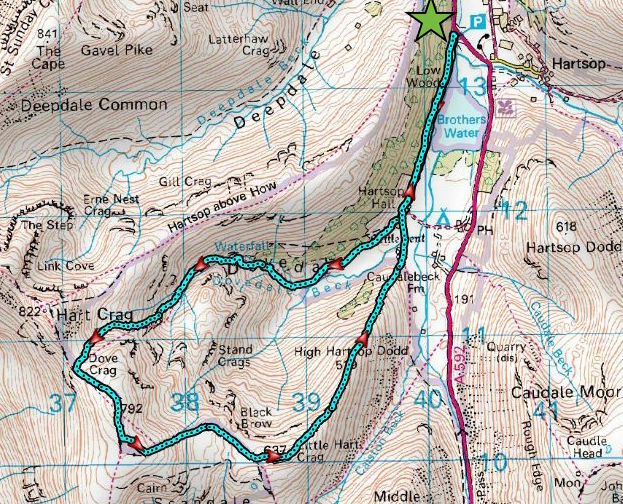 That eventually leads up into the Hunsett Cove route to Dove Crag. We have now joined the old lead mine path from where we can see the Hunsett Cove path towards the bottom of the shot. 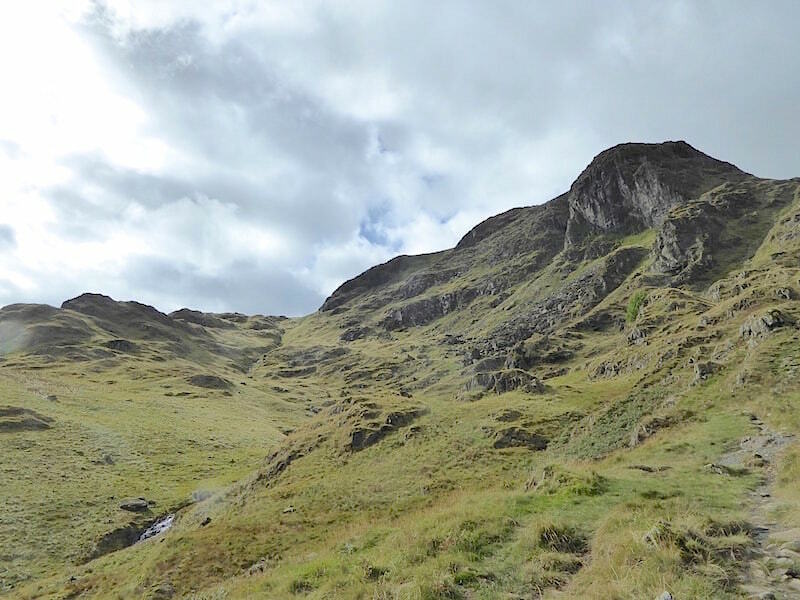 Dominating everything is the impressive sight of Dove Crag ahead of us. 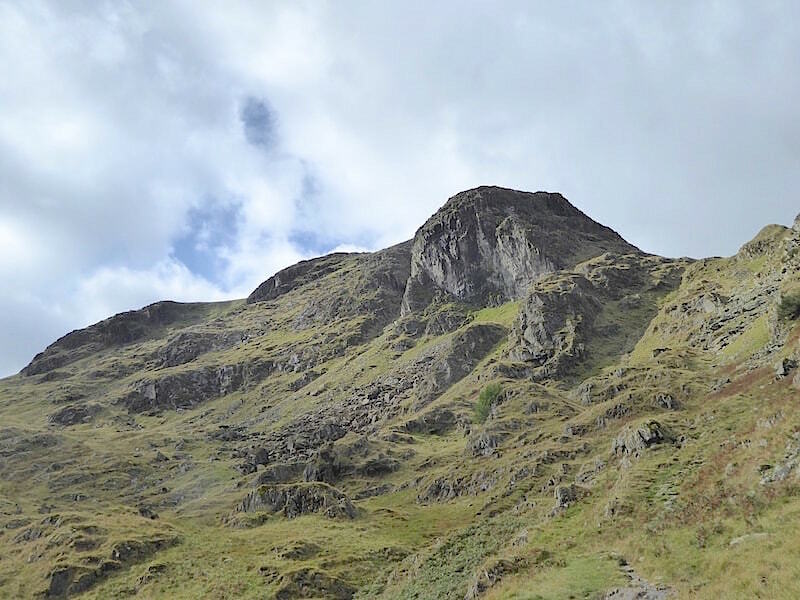 From the Fairfield Horseshoe route beyond the summit Dove Crag appears as nothing more than a slight rise along the way, from the Dovedale side it definitely looks, and feels, more like a mountain. A look back at the bridge where there is still no sign of the workman’s mate returning. 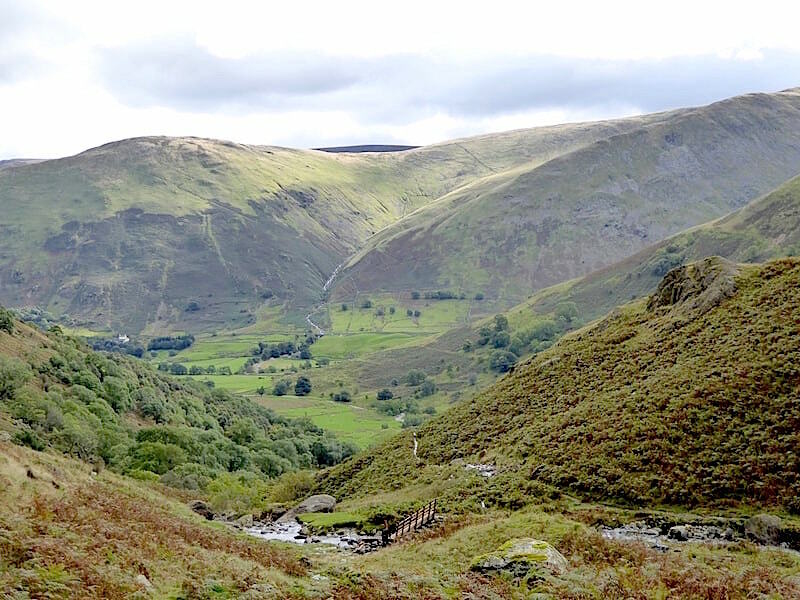 Across the valley we can see plenty of water flowing down Caudale Beck as it carves it way between Hartsop Dodd and Caudale Moor. At last we have a stretch of dry and level walking, it was only brief but it was more than welcome, especially as there is a lot more climbing to come. The bracken is dying back rapidly now, the grass is gradually becoming less green and the becks are full after all the rain lately. The changes are almost imperceptible but autumn is just around the corner. Over to our left and a look across Hunsett Cove where you might just be able to pick out the path snaking its way over the grassy hillside on the left of the shot. 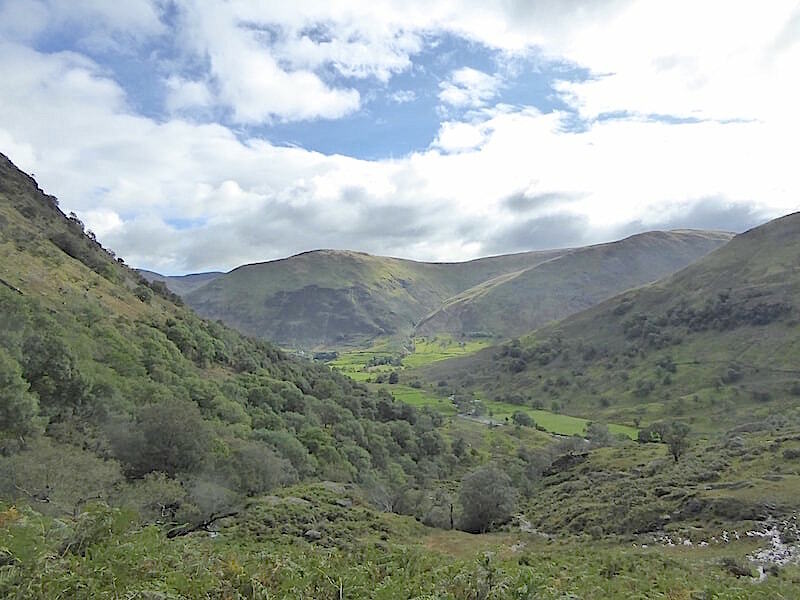 From the same place I took a look back down the valley with Hartsop above How rising over to the left and the rocky cliffs of Stangs, which we have just rounded, over on the right. The narrow level path has broadened out into this rough uphill track so we’re climbing once more. 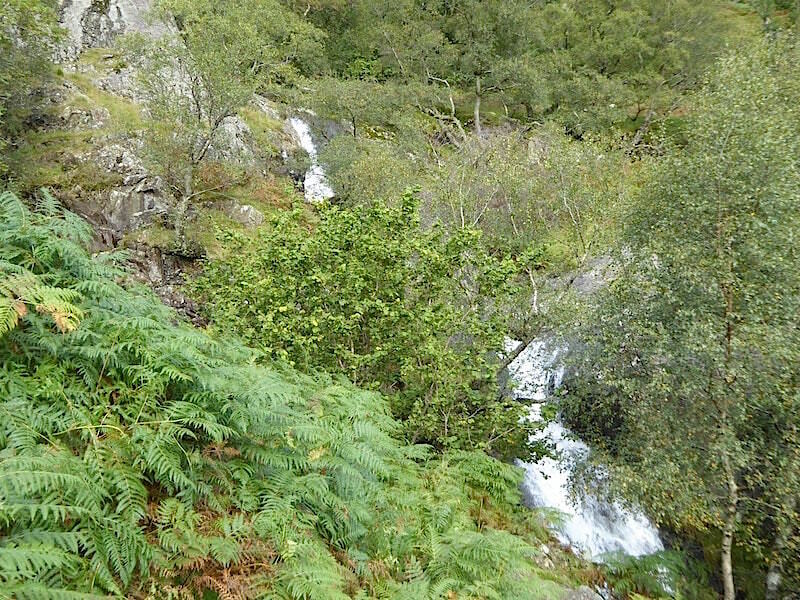 Twin falls in the beck ahead of us which are pretty to look at …..
….. but which needed to be crossed carefully thanks to the amount of water flowing over. 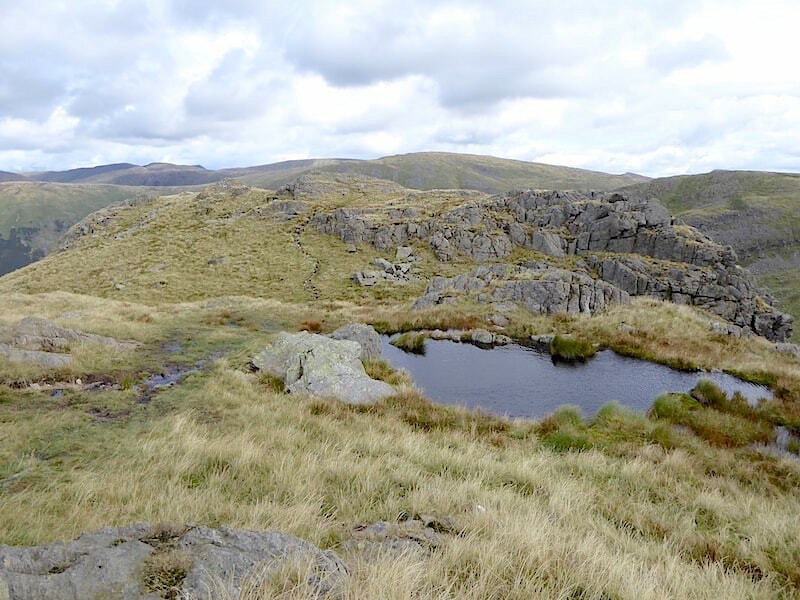 The easier stones were submerged leaving only wet and awkwardly angled ones available, yet another occasion when I wished my legs were just that little bit longer so my stride could be bigger. 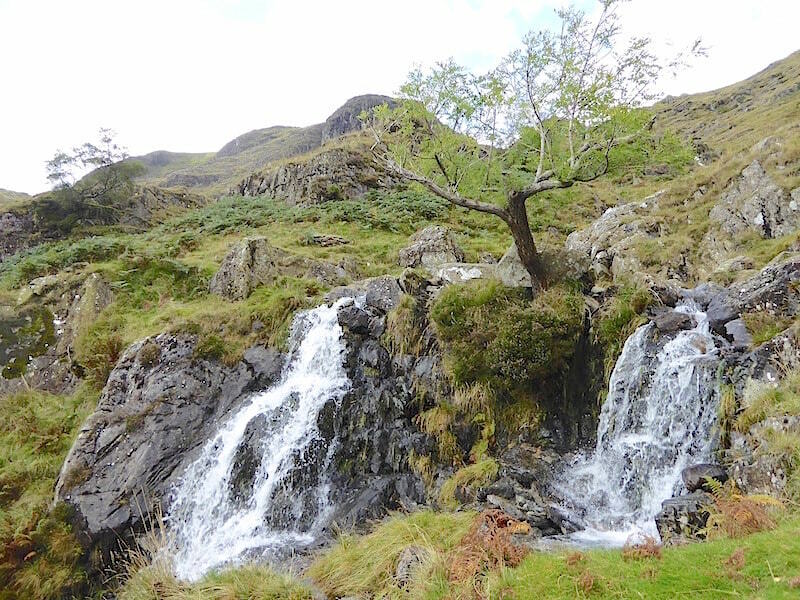 More attractive cascades flowing down to Brothers Water. We’re still quite a way off the summit, which is some way behind the most prominent rock on the skyline, but this close up shows the route we are following. 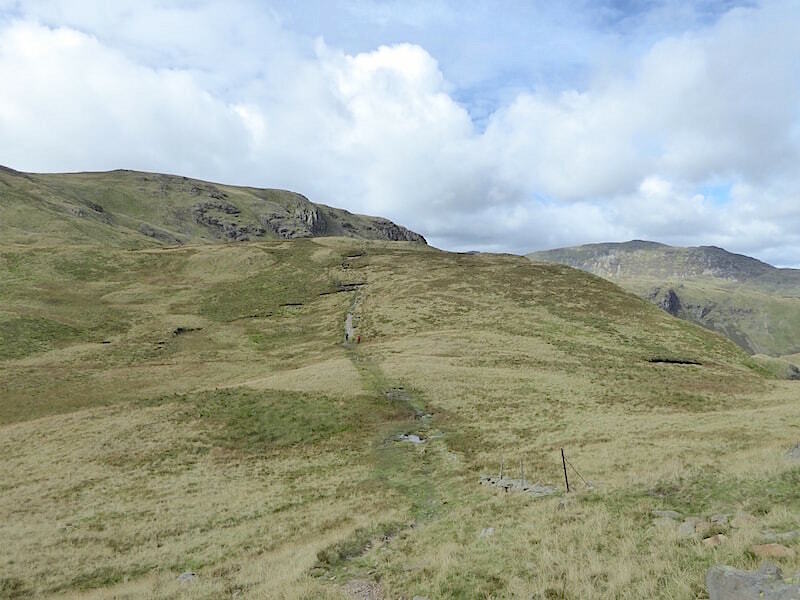 Starting at the bottom right the path will lead us over to the gully on the right of the line of crags just beside the light green patch of grass below the most prominent cliffs. A longer view of Hunsett Cove below the cliffs. 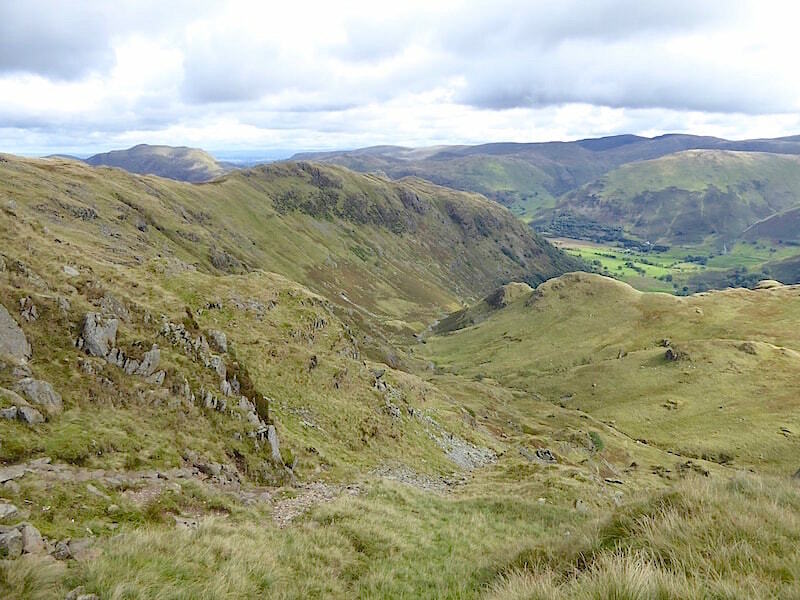 Another look back down Upper Dovedale and noticing that the summit of Hartsop above How, on the left, has come into view. The path has narrowed once again and the occasional large stones beside it came in very handy on several occasions. Its a long, long climb and the legs are feeling the effects now. It looks dauntingly steep, and it is, but we press on and try to ignore the grumbling leg muscles. At long, long last we reach the base of the cliffs where the steepening path up the gully staircase seems to stretch into infinity. Just below the skyline, at the highest point of the cliffs on the left, you may be able to pick out a darkish, horizontal shape, this is the entrance to a cave known as the Priest’s Hole. 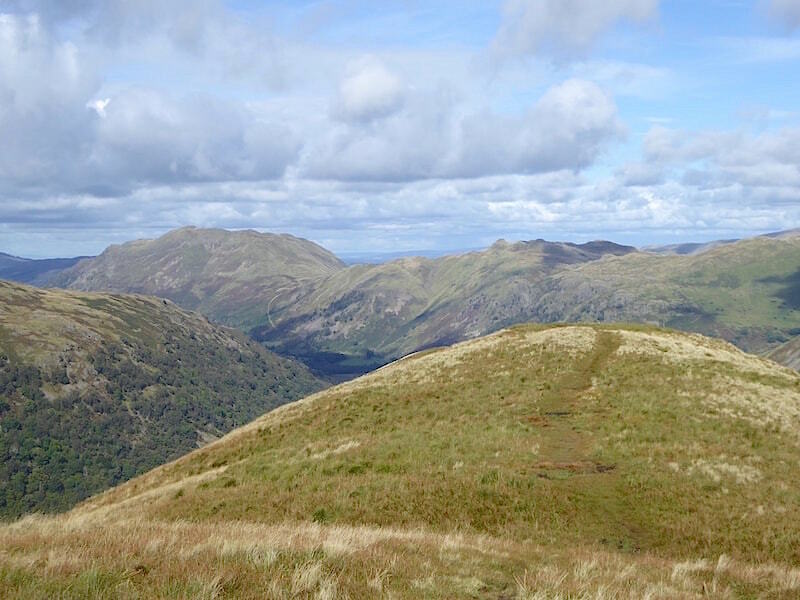 Its become something of an attraction for a lot of walkers since it was featured in a ‘Secret Brtain’ TV programme early in 2016, but it has its dangers and fatalities and serious injuries have occurred before, and since, the programme was first shown. We could hear voices above us so it was obvious that the cave had some visitors. 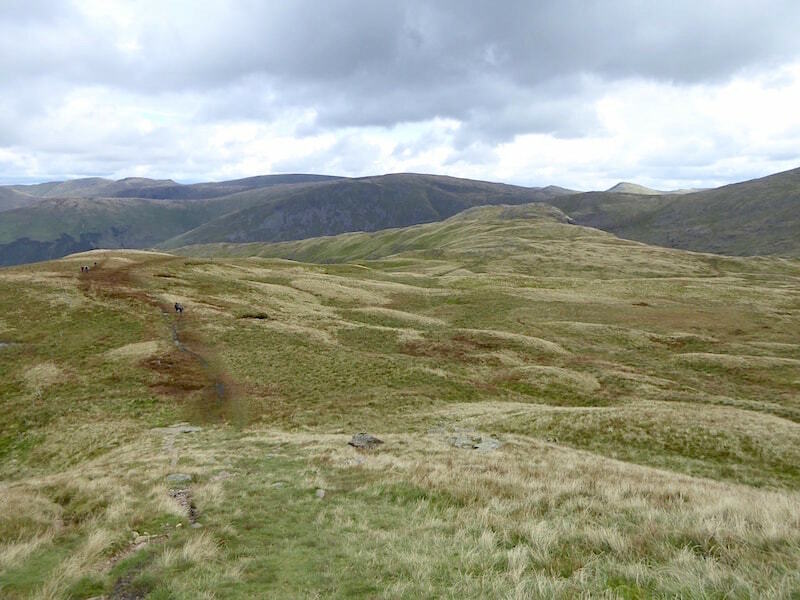 The far eastern fells begin to appear as we climb higher. 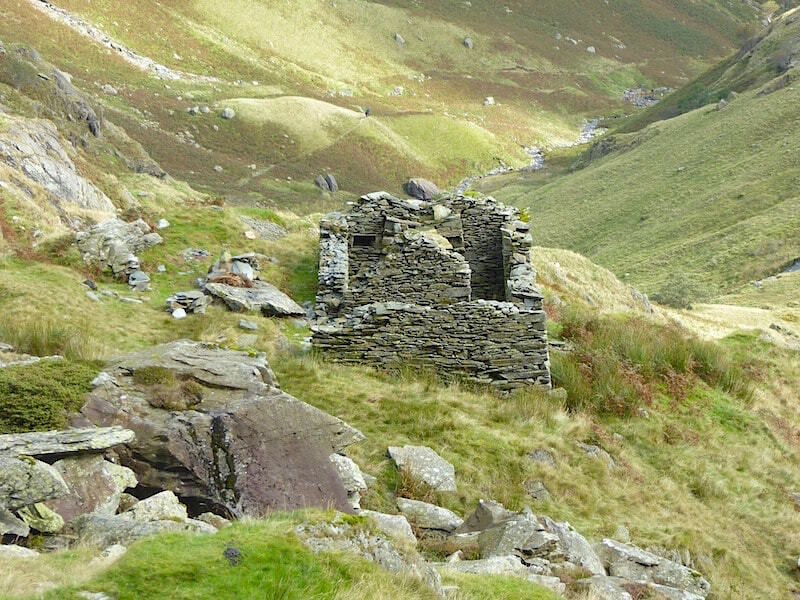 Its an odd place to find a derelict building …..
….. which looks a bit too elaborate for a shepherd’s bothy, but too small for domestic habitation, and there weren’t any signs of mining or quarrying nearby that we could see, so its purpose remained unknown to us. 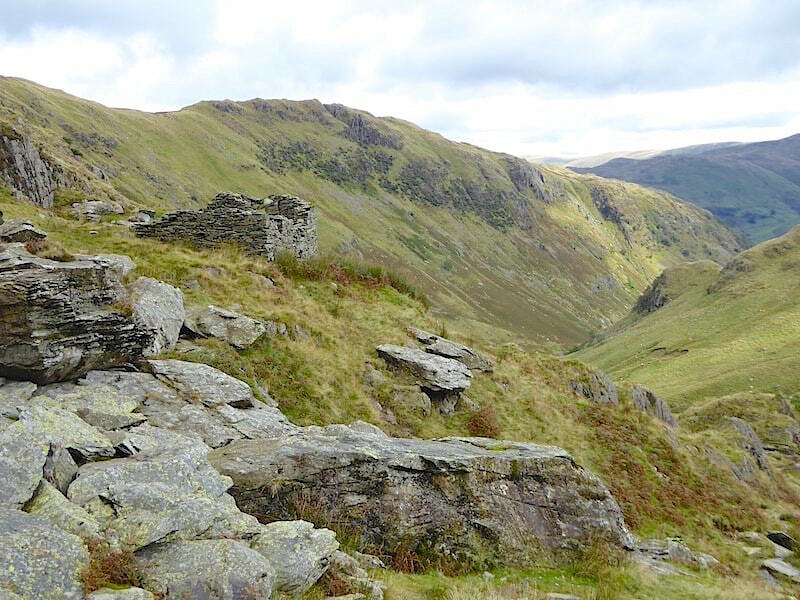 The ruined building recedes as we climb the gully staircase, a pitched path up the very steepest section of the route …..
….. and its a hard slog, especially so coming at the end of over three and a half miles of climbing so far. 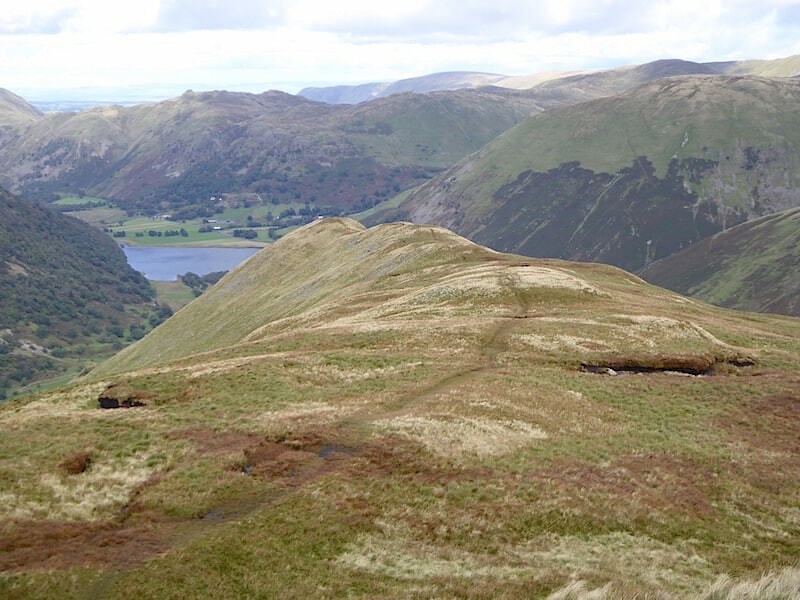 The low point on the skyline marks the point where the pitched path comes to an end and where we’ll walk out onto the grassy shoulder of Dove Crag. 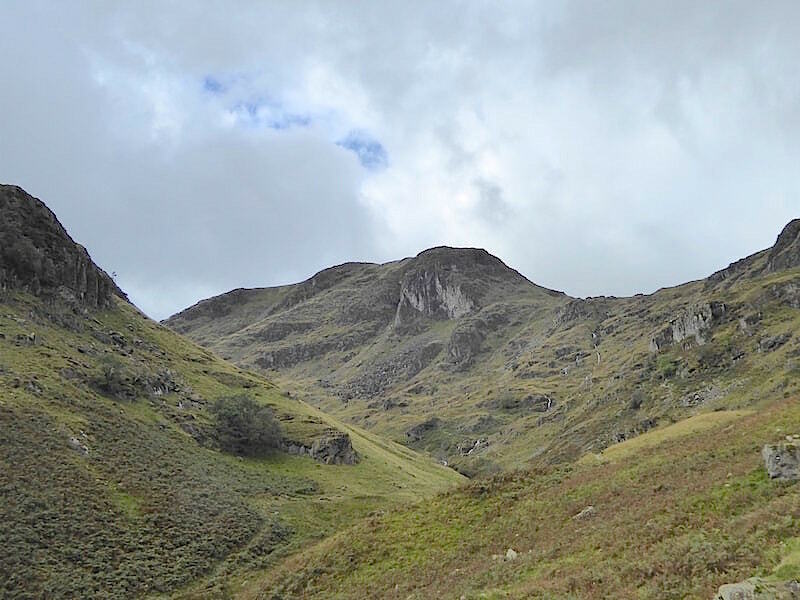 I stepped off the pitched path, on the left, onto a grassy hillock, with the Priest’s Hole a good number of feet directly above me, to take a look back along the route we had taken, that was one very steep climb was the first thought that came to mind. Hearing voices behind me I turned around and looked up to see the four young lads, who had passed by us earlier, still in boisterous spirits, standing on the very edge of the Priest’s Hole seemingly oblivious to the perilous drop below them. I returned to the path and we set about completing the last few feet up to the grassy shoulder. 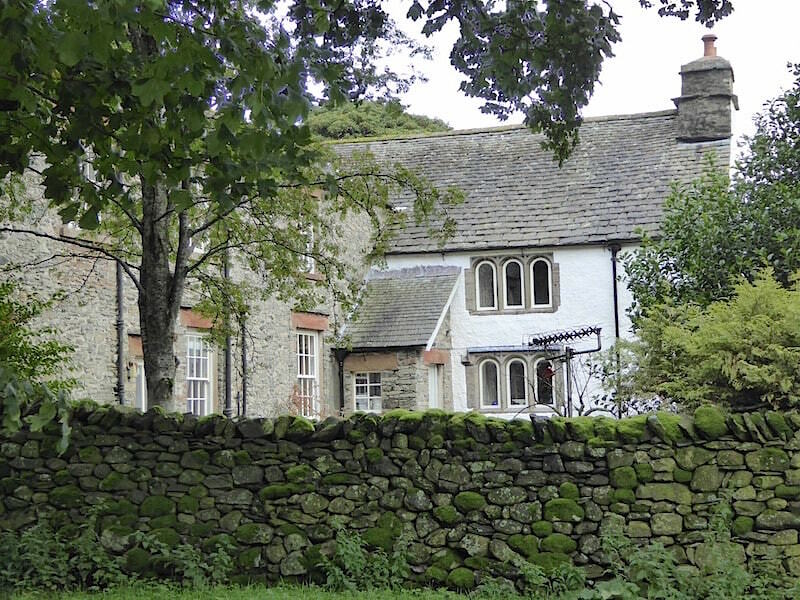 As we did so we were aware of the four lads making their way down from the Priest’s Hole, suddenly there was a shout/yell and we looked across to see that the first lad in the line had fallen and was slithering down whatever bit of path/grass they were using. Fortunately he managed to stop himself and got back on his feet accompanied by laughter from his mates. Perhaps he didn’t give himself long enough to settle but shortly after setting off again he was on the ground again. There was even more laughter but perhaps this second stumble woke them up and they seemed to take their descent a little more slowly and carefully from then on. They were still descending by the time we reached this boulder on the grassy shoulder below Dove Crag. The boulder marks the point at which you would need to turn, roughly south eastwards, to make your way across to the Priest’s Hole. 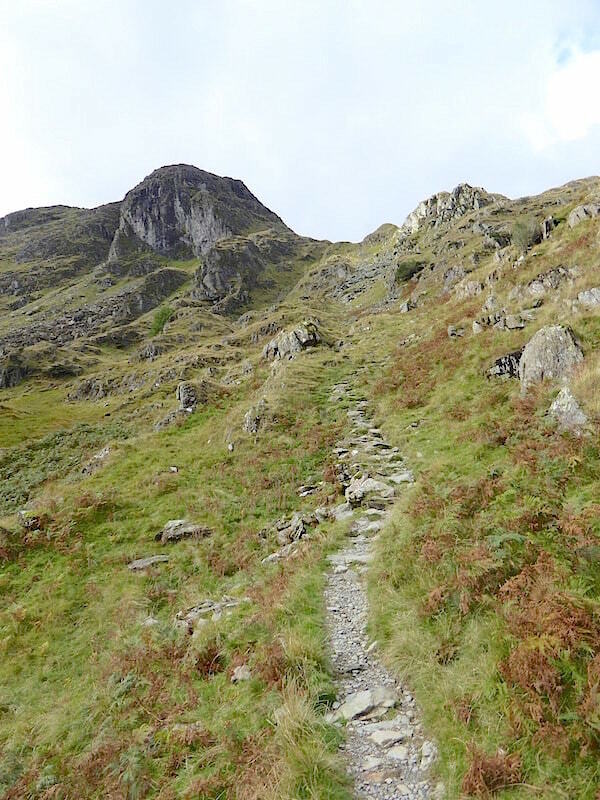 The climbing isn’t yet over as we still have to make our way up to the ridge between Dove Crag and Hart Crag but at least the path is a lot less steep. I took a look back to the boulder and the marshy area around it, towards the right of the shot. If you zoom in you might be able to spot the four lads, now appearing like four black specks, over to the left. 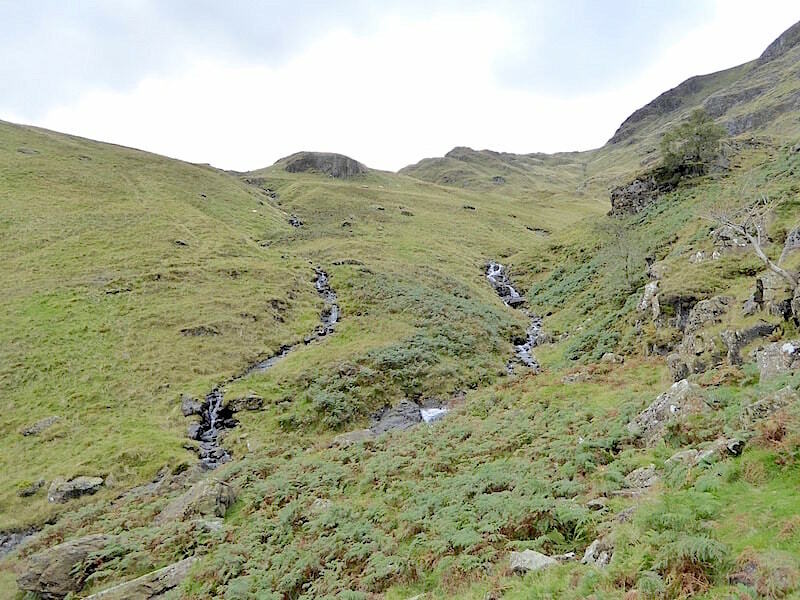 They had made it back to the boulder, presumably without further stumbles, and were now crossing Houndshope Cove on their way over to Hartsop above How and, I suppose, back down to Patterdale. 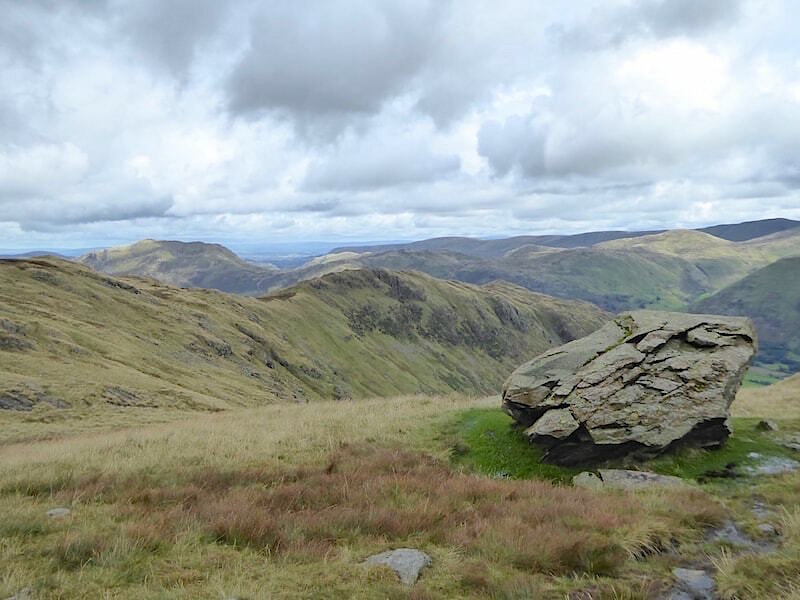 There’s no way of knowing if they went to the top of Dove Crag, they certainly didn’t bother going over to Hart Crag, so perhaps the Priest’s Hole was their only target today. 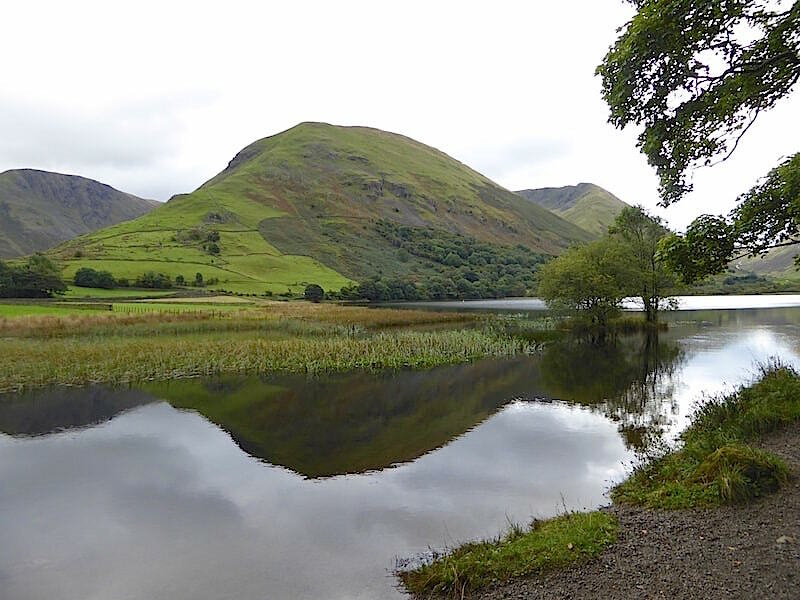 A look across Houndshope Cove to Hartsop above How and the fells beyond as we continue the climb up to the ridge. Just before we reached the ridge line we decided to stop and take advantage of the small boulder field to have our lunch stop. 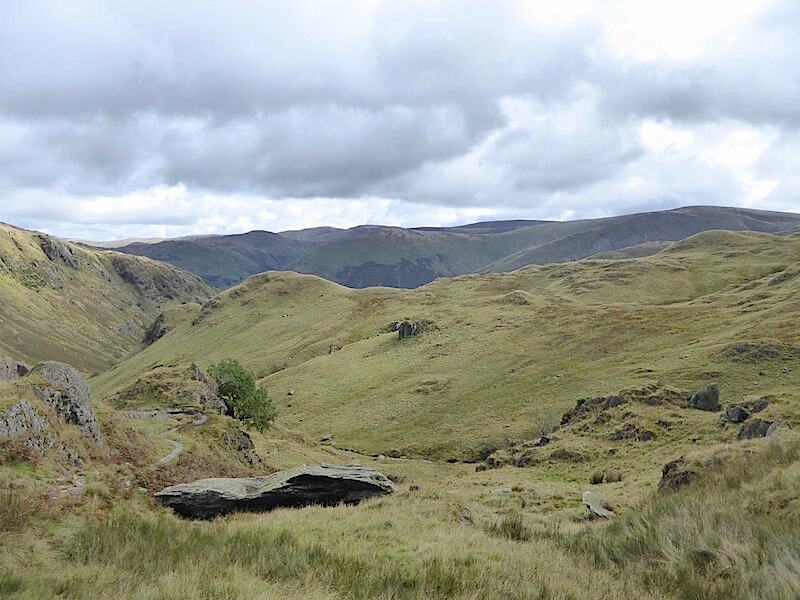 Here we were in the lee of Hart Crag and sheltered from the north westerly wind which was becoming stronger as we climbed higher. Lots of rocks to choose from for seating, plenty of flat ones to put the gear on so once we were settled and organised out came the food and drink and we tucked in. We were more than ready for this re-fuelling stop as our tanks were just about running on empty at this point. Apart from that we decided against waiting until we reached the summit because we knew it would be way too windy to be comfortable. 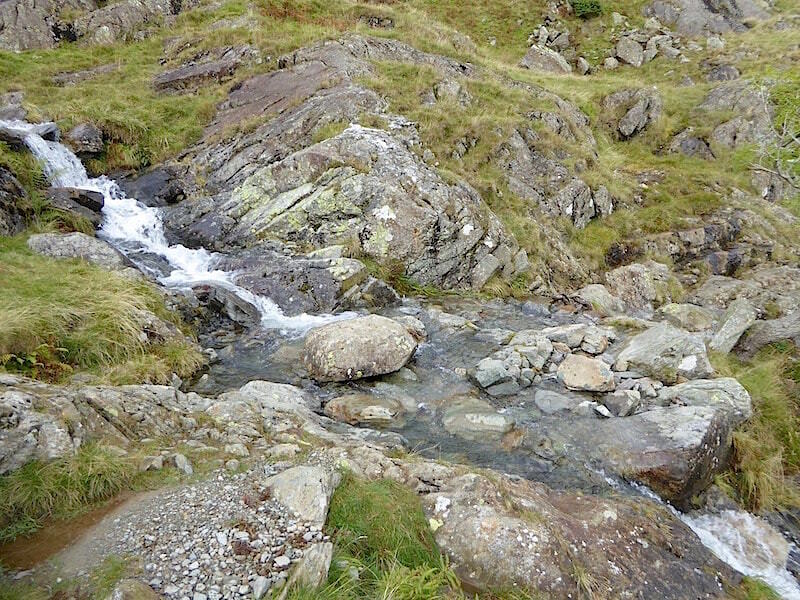 We had a twenty minute rest and refuelling stop here after which we returned to the path and continued on up to the ridge. Hart Crag over on our right as we climbed the last few yards to the ridge. 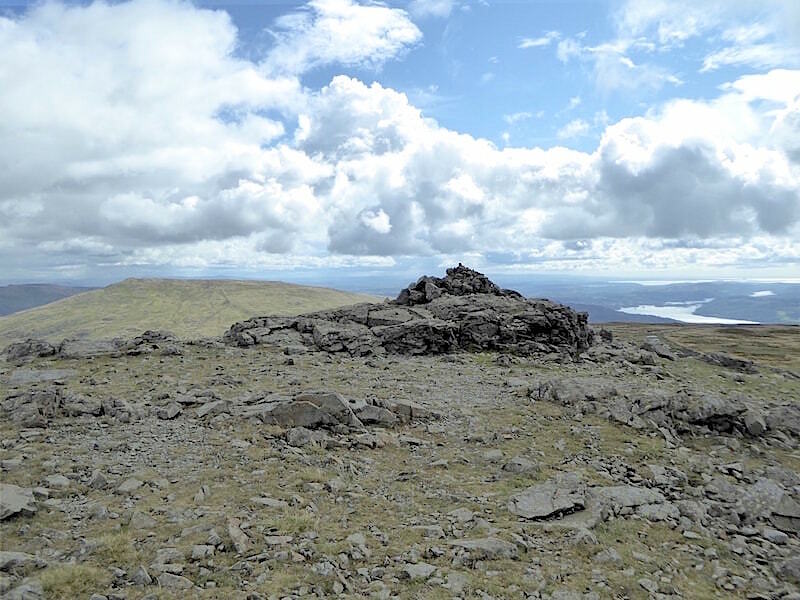 Several little groups of walkers had tucked themselves into the shelter of the rocks below the summit and were enjoying their lunch breaks in the sunshine. At the broken wall we turn left and follow the path over to the summit which you can see over towards the left. 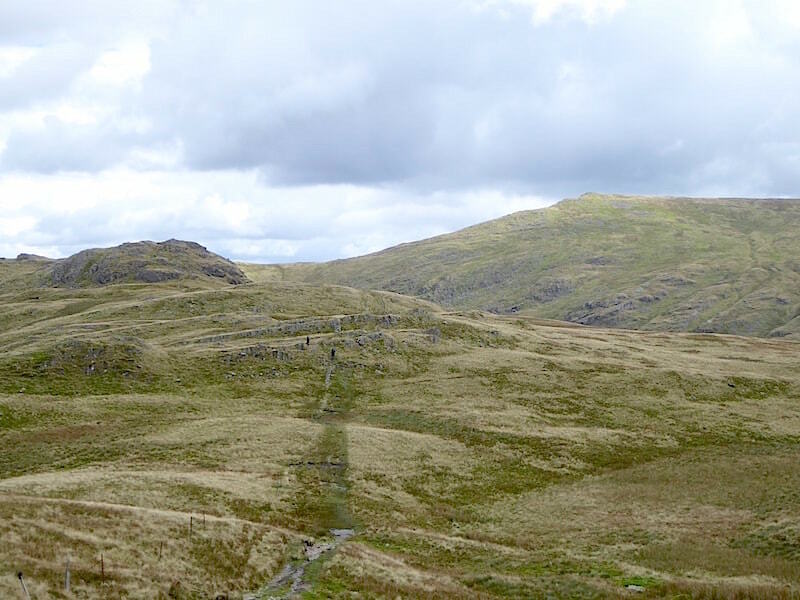 There were many more walkers in both directions up here now as they made their way around the Fairfield Horseshoe. 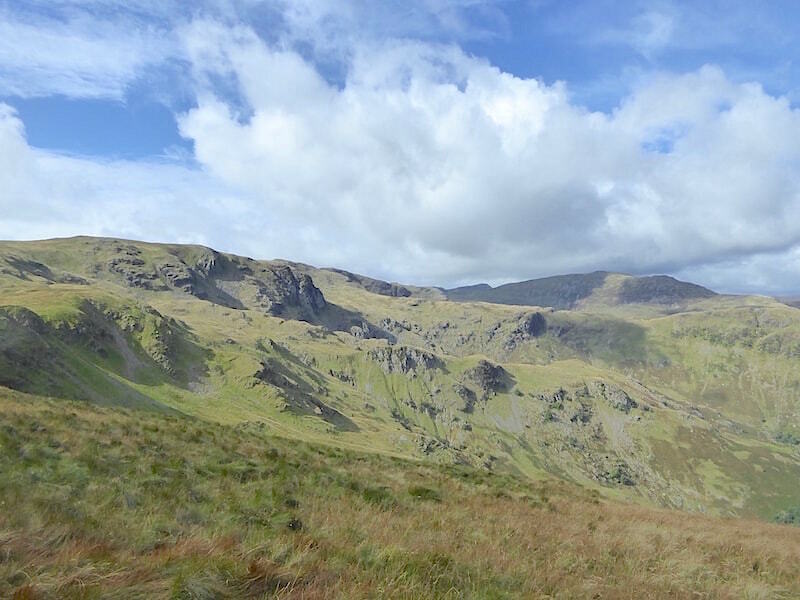 Its easy to see why Dove Crag doesn’t appear to be anything very remarkable from the ridge line. 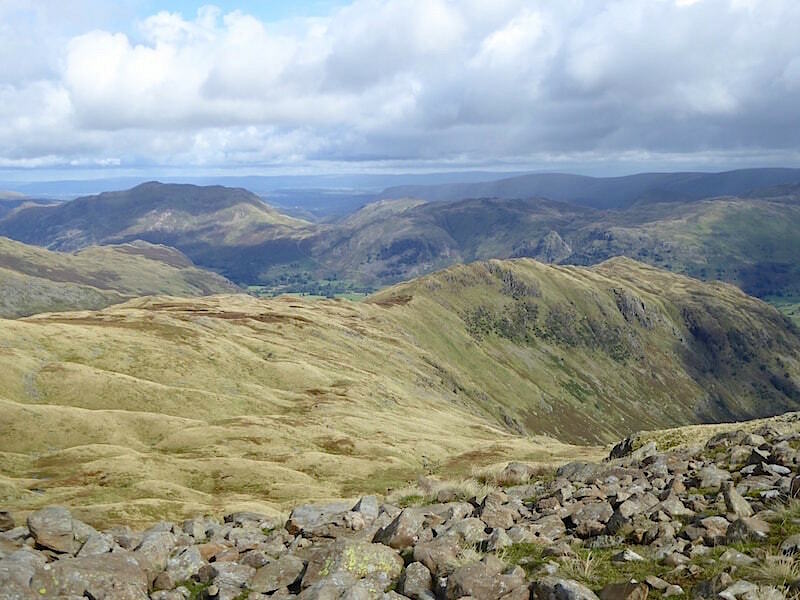 Here I took a look back along to Hart Crag with Fairfield over to the left behind it. 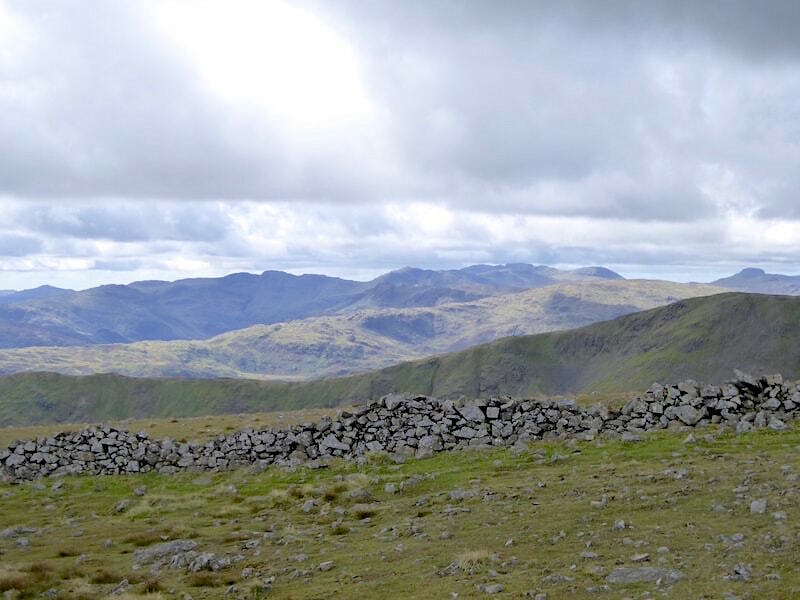 Dove Crag summit with Red Screes behind it, on the left, with Windermere over to the right. We were wise to have our lunch stop below the ridge line because it was blowing a hooley up here. 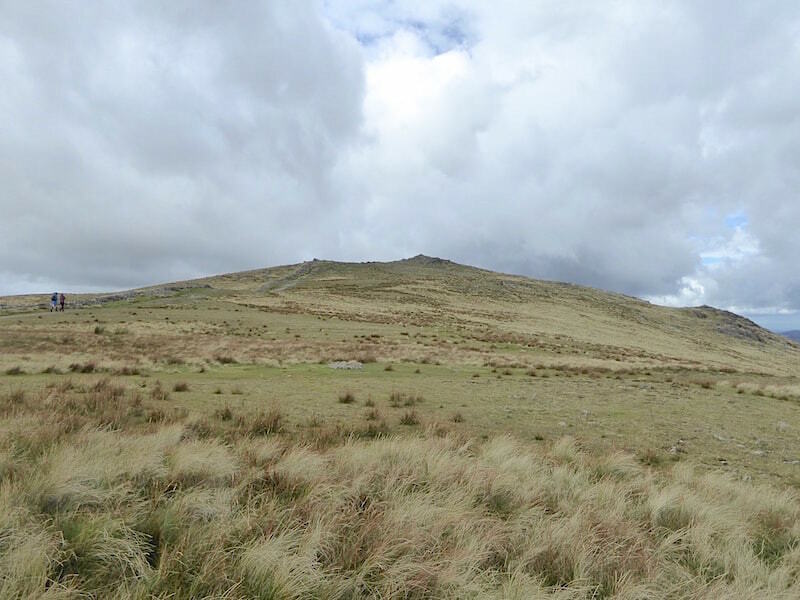 The route we took from Cow Bridge up to the summit was a fraction over four miles, according to the gps, so no wonder the needle on the energyometer was hovering near the weary end of the scale. 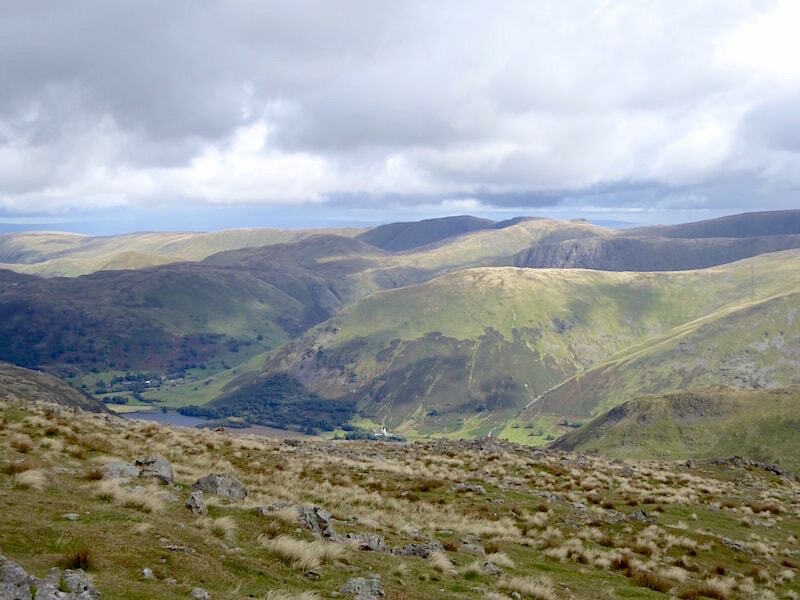 Despite the wind doing its best to blow me over I managed to stand upright long enough to take this shot of Red Screes opposite us, with Froswick, Ill Bell and Yoke in the shade behind it …..
….. and this one of some of the far eastern fells along with a smidge of Brothers Water below them. ….. where I cower into my jacket hood and gloves, It wasn’t pleasant so we didn’t linger. 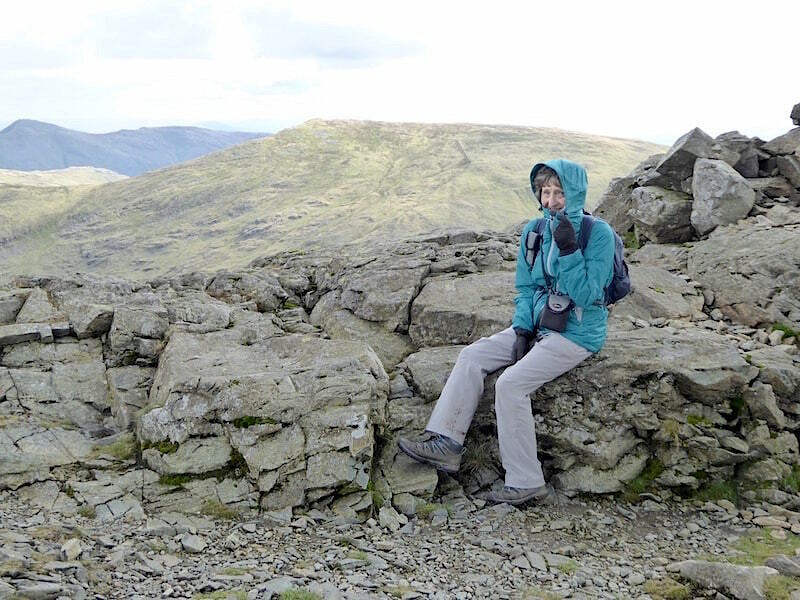 Now I know it was windy and a bit chilly, but lots of people walked across while we were here and not one of them even glanced at the summit, never mind walk over to it and check out the views to be seen from it. 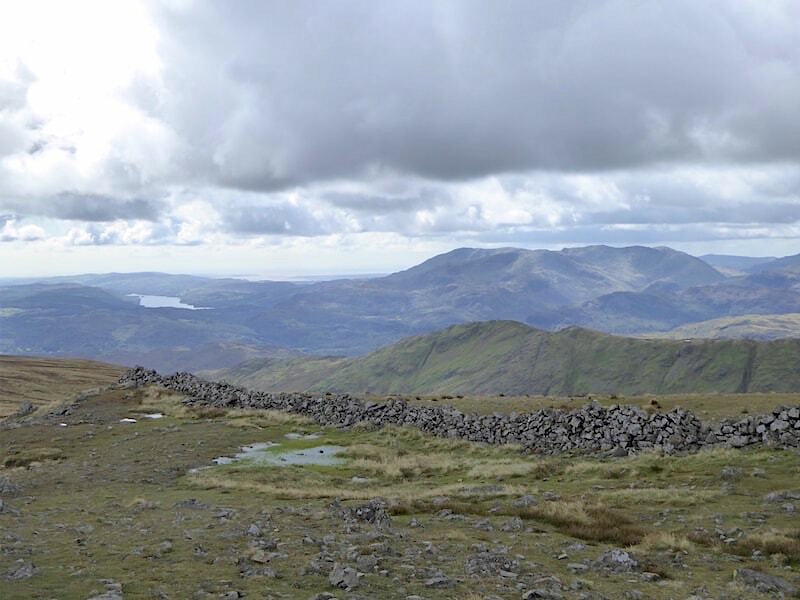 Unfortunately this view is a bit on the glum side thanks to that big grey lump of cloud overhead, but over to the left is Coniston Water with the Coniston Fells to the right of it. 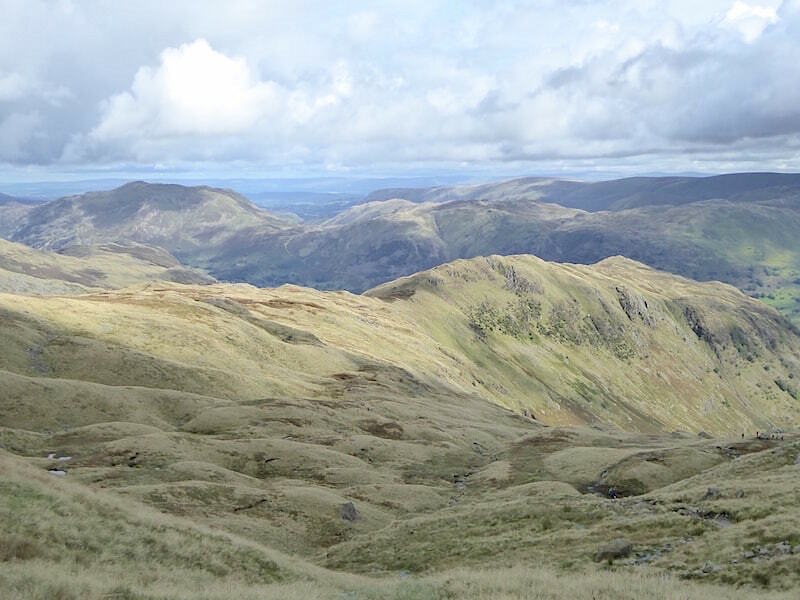 A little further to the right and on the skyline, from left to right, are Harter Fell, Pike O’Blisco, Crinkle Crags, Bowfell, the Scafells, Great End and Great Gable. The conditions weren’t great so its not a brilliant shot but it was the best one available today. 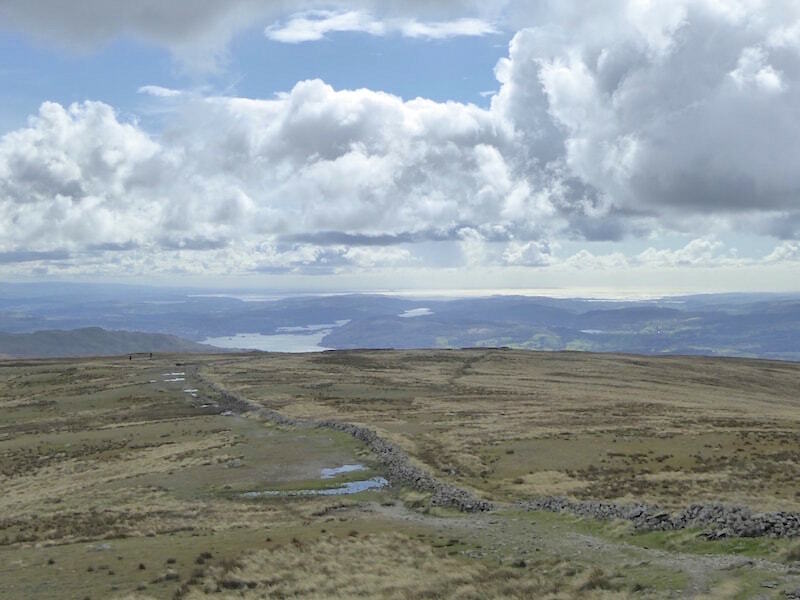 Windermere and the sea beyond as we descend Dove Crag. 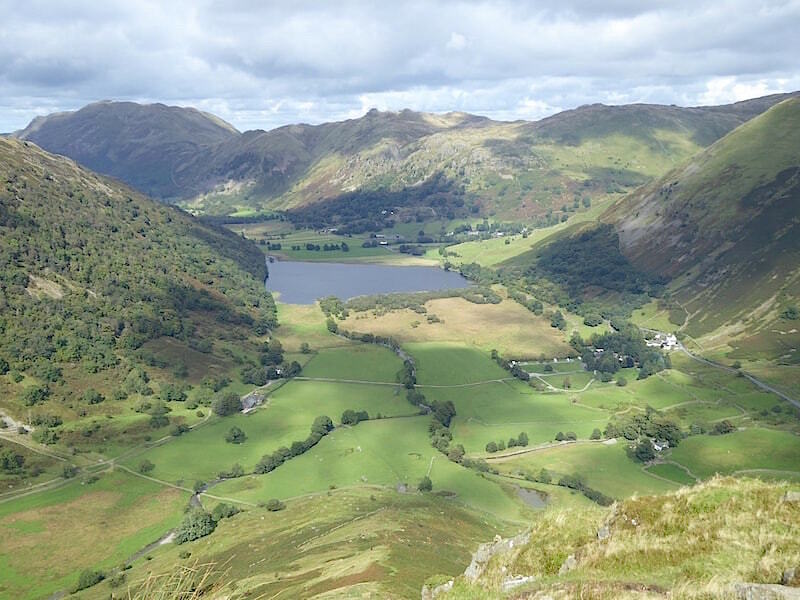 As we left the Fairfield Horseshoe path and cut across to pick up the one over to Little Hart Crag I took a look back at Dove Crag. It looks positively benign from this side and very far removed from the more intimate acquaintance we had with it on the way up through Dovedale. If it hadn’t been quite so windy we would have walked over to those crags on the right for the splendid views down Dovedale. 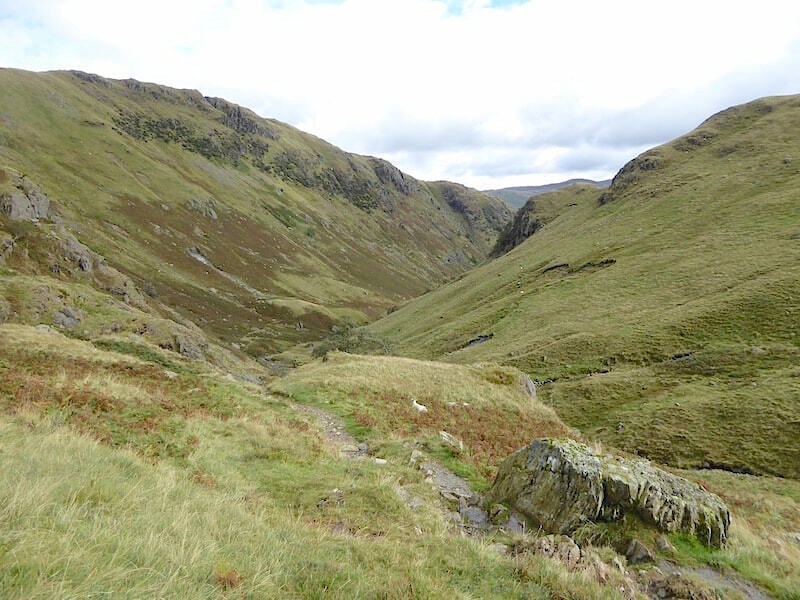 Its more or less downhill from now on as we make our way across to Little Hart Crag, that’s the little humpy area to the right of centre. Going off to the left of it is the ridge going down to High Hartsop Dodd. 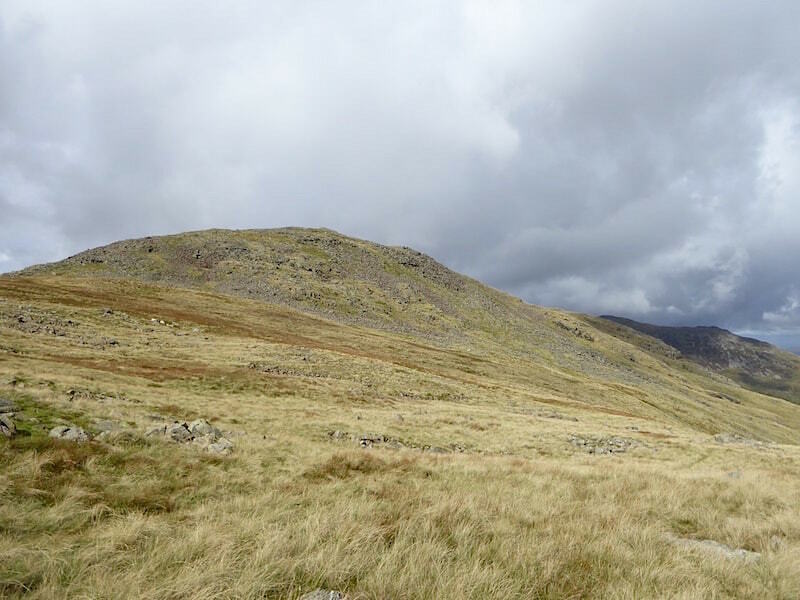 Approaching Black Brow, further along the route to Little Hart Crag, with a couple of walkers ahead of us. This pair, a young man and woman, had trudged wearily past us when we stopped for our lunch break. They must have stopped for a while too, at some point just beyond us, because by the time we reached the broken wall on the ridge they suddenly appeared behind us. They weren’t stopping to take photos though so they continued to stay ahead of us all the way from Dove Crag over to Little Hart Crag where we lost sight of them. 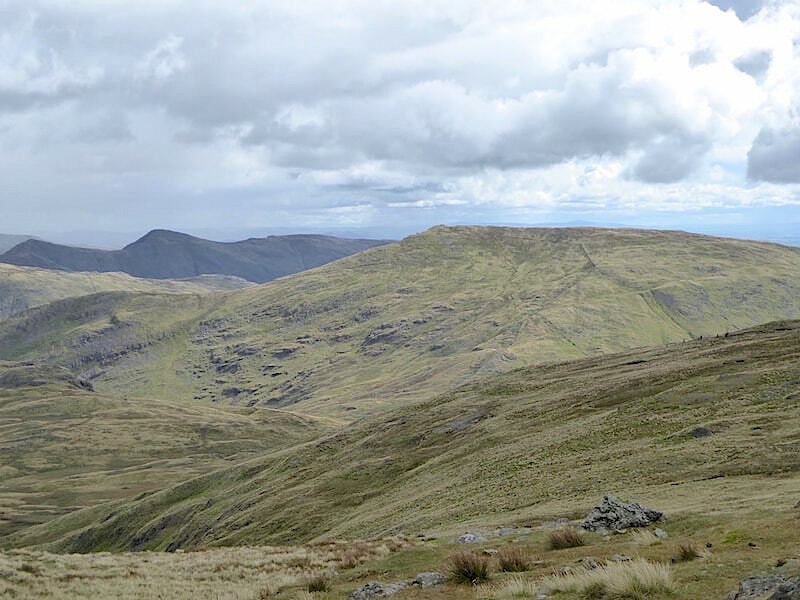 Little Hart Crag on the left and Red Screes on the right with the pair of walkers still in sight. 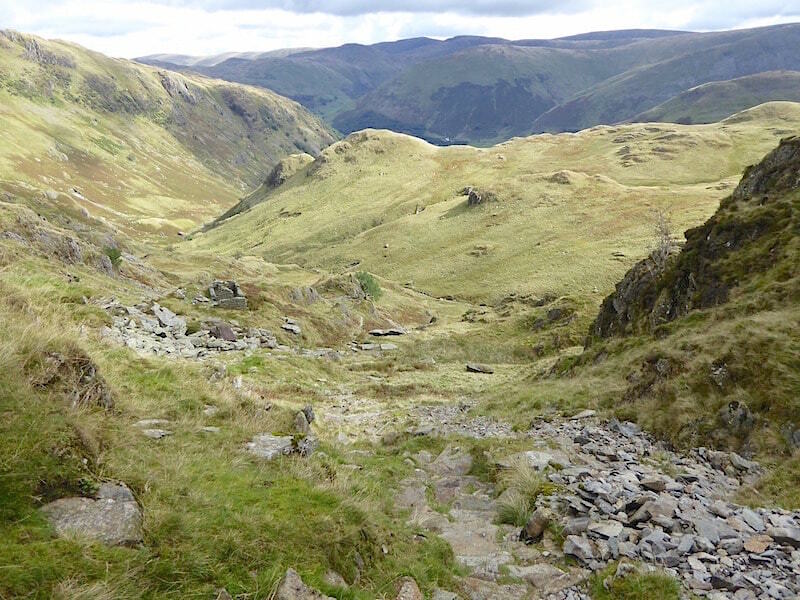 More walkers following on behind us as I take a look back at our descent route from Dove Crag, which is partly hidden by the rising ground in front it. 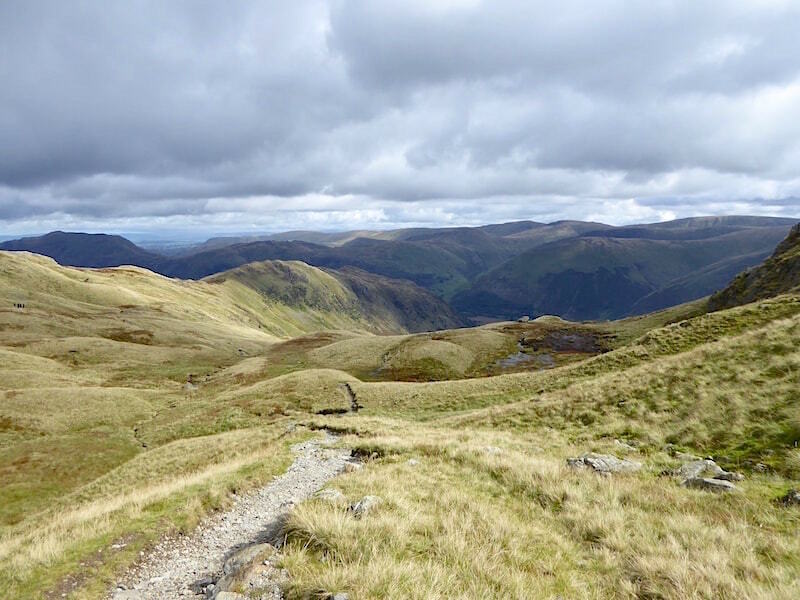 We leave the main path which continues on down to the Scandale Pass and cut across to the left, over the permanently boggy ground, to make our way up Little Hart Crag. 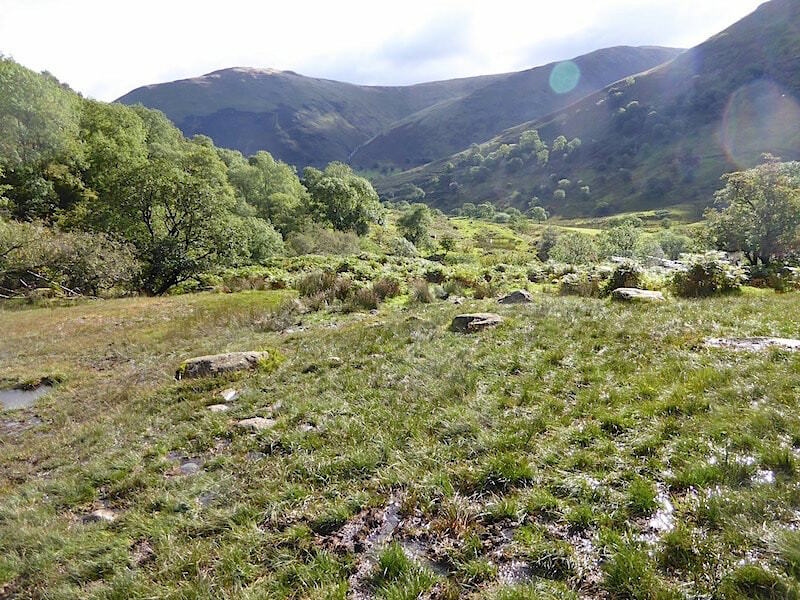 The two walkers who had been ahead of us were nowhere to be seen so we supposed that they had descended to the pass and returned via Caiston Glen. 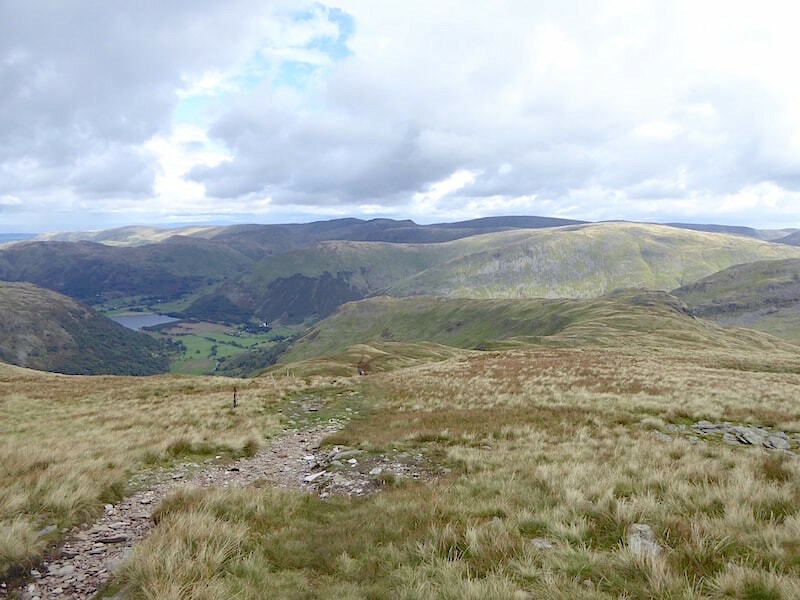 A look back from the cairn on the first top we arrive at on Little Hart Crag where Dove Crag and Saint Sunday Crag, left and right respectively, dominate the skyline, with Helvellyn playing a bit part as a shadowy bump squeezed between them in the centre. The path winds its way from top one down into the hollow and up the other side to top two where we were exposed to the strong north westerly once again. 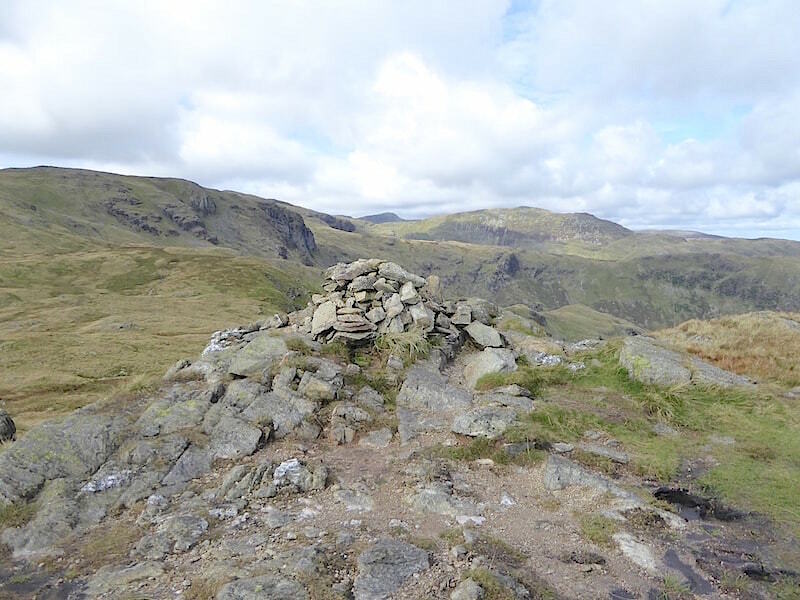 Its not often you can walk down to a summit but that’s the case here as we follow the often squelchy path across the ridge between Little Hart Crag and High Hartsop Dodd. Apart from us there wasn’t a soul to be seen along here. Dropping ever lower down the ridge with increasing protection from the wind and enjoying a longish spell of sunshine as we did so. 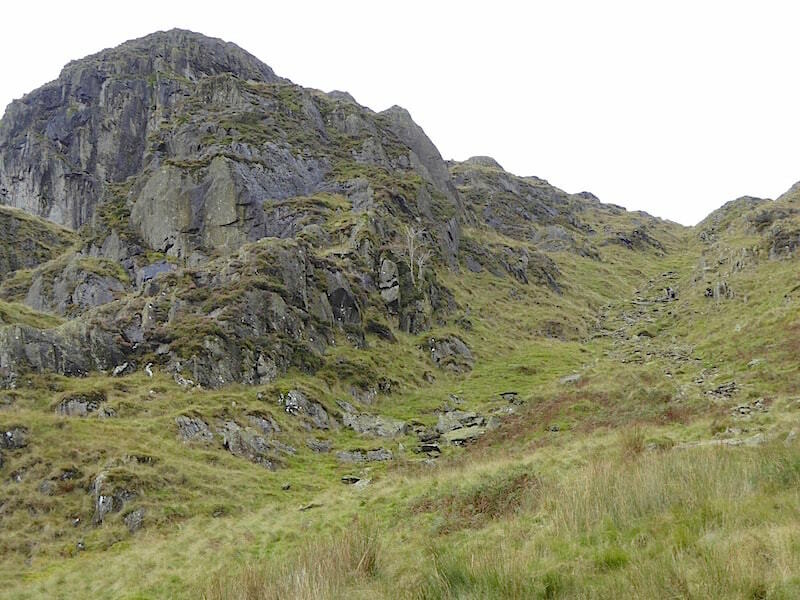 Dove Crag is now sandwiched between the Stand Crags ridge in the middle foreground and the ridge up to Hart Crag just behind it. Making our way towards the summit with a view of Place Fell and Angletarn Pikes beyond it, a very enjoyable tramp across in the warm sunshine. 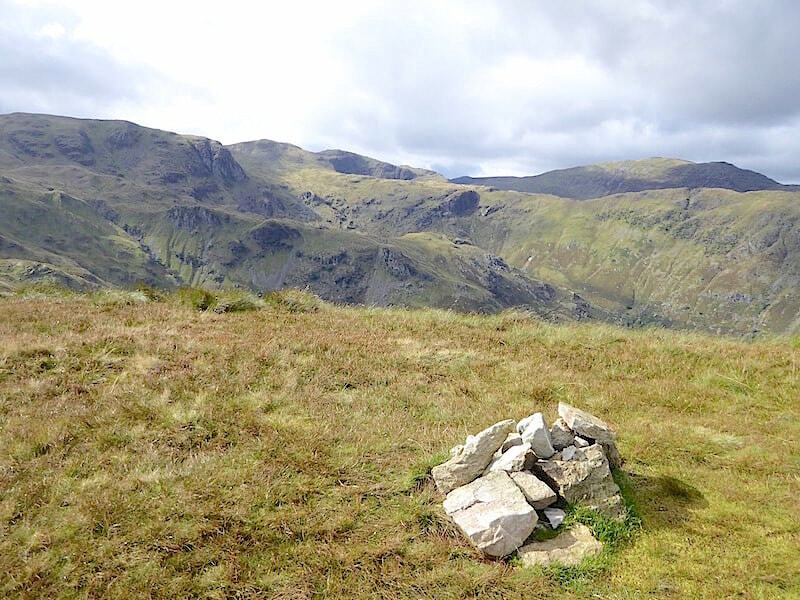 Another view over to the west from the modest little cairn marking the summit of High Hartsop Dodd. Why this point should be designated as the summit always puzzles me as we have just walked down over clearly higher ground beyond it. 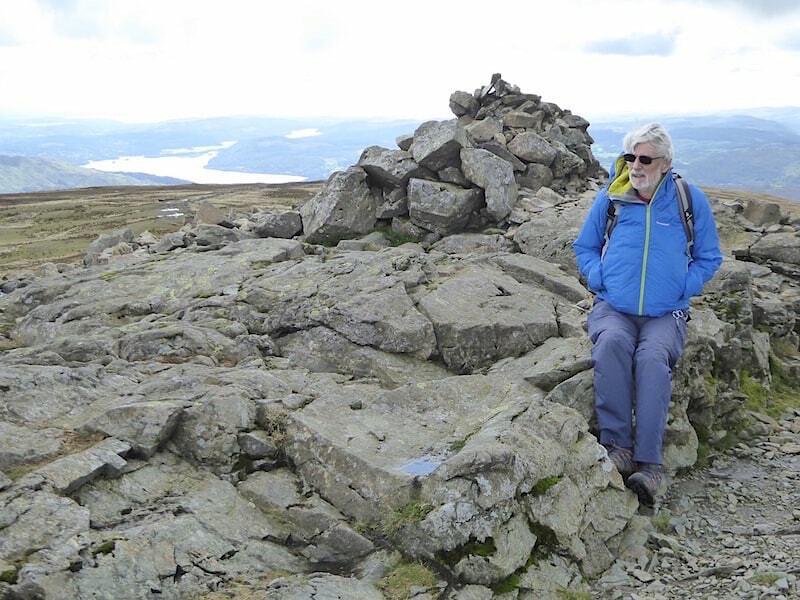 Maybe whoever was in charge of summit marking at the time just couldn’t be bothered lugging the stones any further up the ridge. 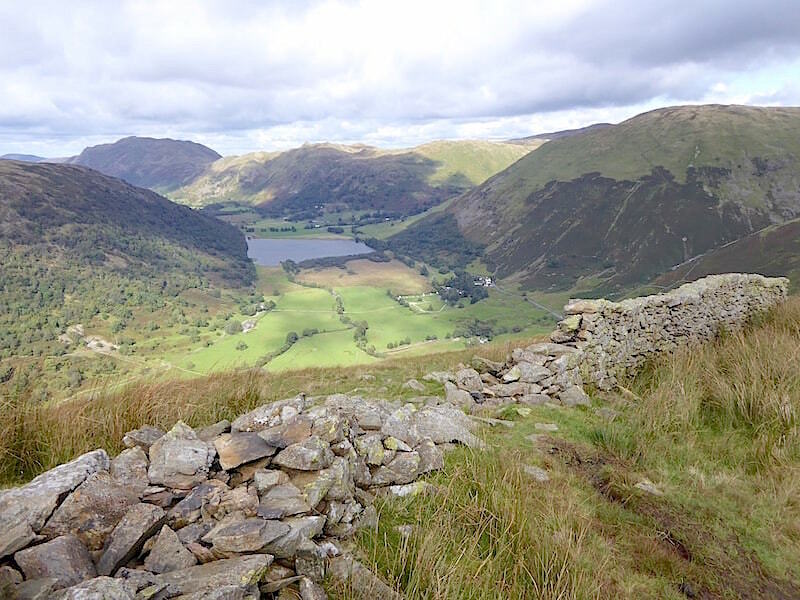 Beyond the broken wall you have this lovely view down to Brothers Water flanked by Hartsop above How on the left and some of the far eastern fells on the right. 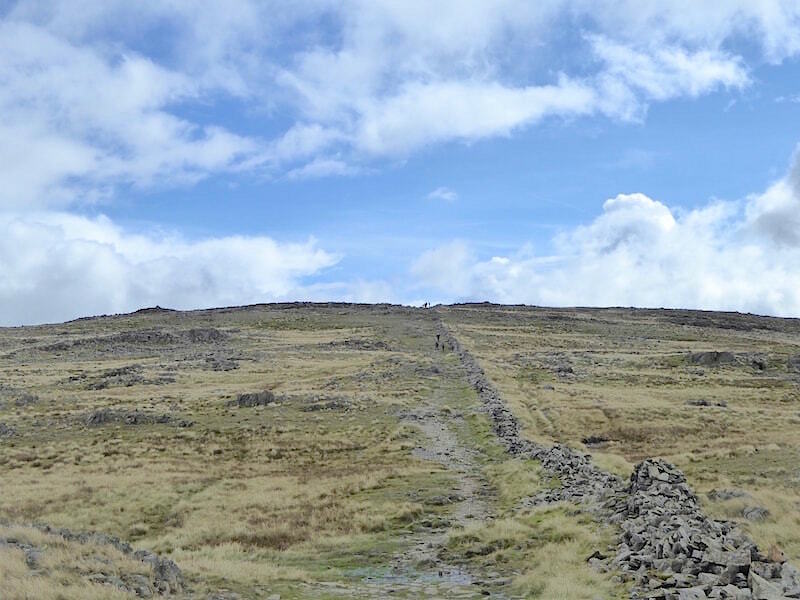 The descent from here now begins to become …..
….. quite a bit steeper where the path seemingly drops into the abyss, so its goodbye to easy moorland tramping and hello to jolted joints and heavy on the brakes. The old rickety stile, which was alarmingly wobbly, has been replaced with a much firmer one since we were up here last in May 2016. 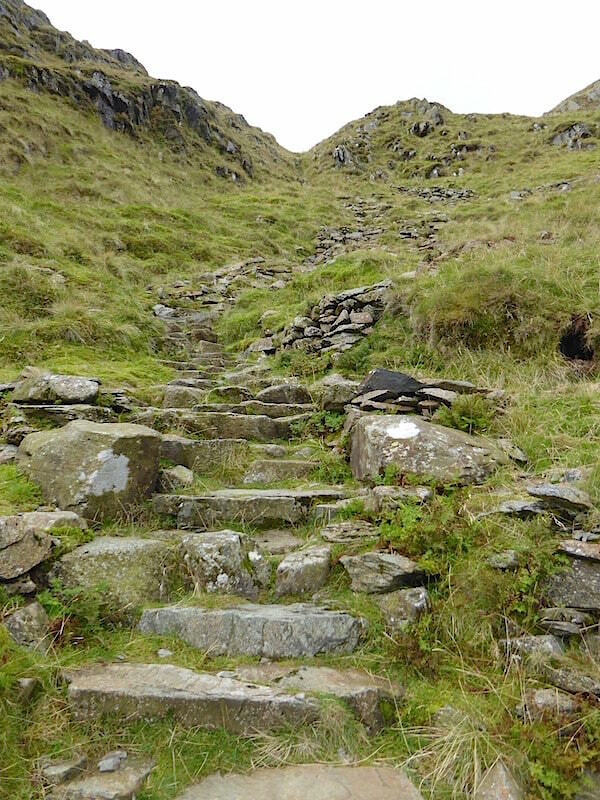 Once over the stile there is more steep descent but it is the last section so it won’t be too much longer until the muscles can stop screaming and enjoy some relaxing level walking again. That path across the field directly below us still seems very far away though. 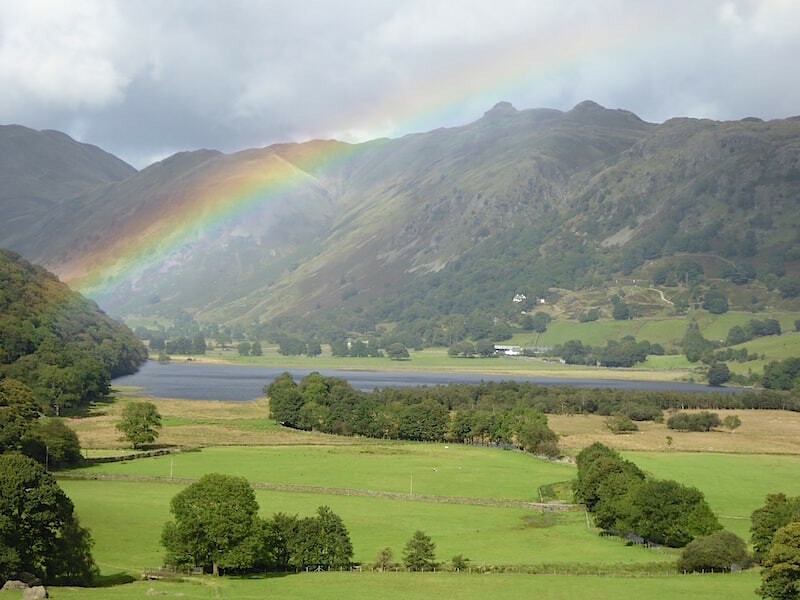 A very brief and unexpected shower gave rise to this lovely little rainbow arching over Angletarn Pikes. We didn’t bother with the waterproofs as it was over and done with after a couple of minutes. Safely down to the old barn without any problems and the brakes can come off the legs at long last. I would have taken a shot looking back up but the sun was out in that direction so there was nothing to be seen but dark silhouettes. 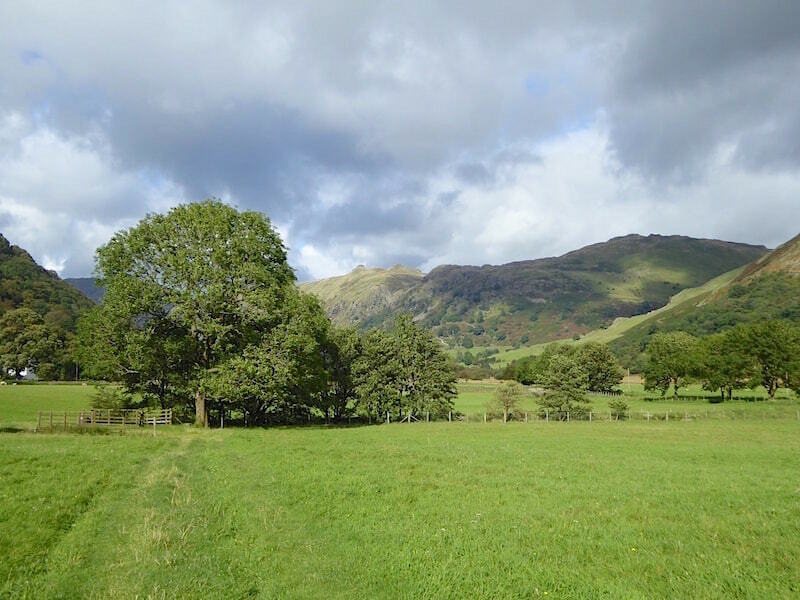 Just what the doctor ordered – a level walk back over the grassy fields for which our legs were duly thankful. At the end of the field we passed Hartsop Hall again and then joined the track alongside Brothers Water where dad and son were enjoying a spot of fly fishing, while mum and grandpa looked on. Back at the car park at Cow Bridge with a view of Caudale Moor in the afternoon sunshine beyond. Goldrill Beck is full and running fast thanks to all the recent rains and, as usual, both car parks have filled since we arrived this morning. We flop into the car seats, stretch out our legs, drink some fruit juice and review the walk. 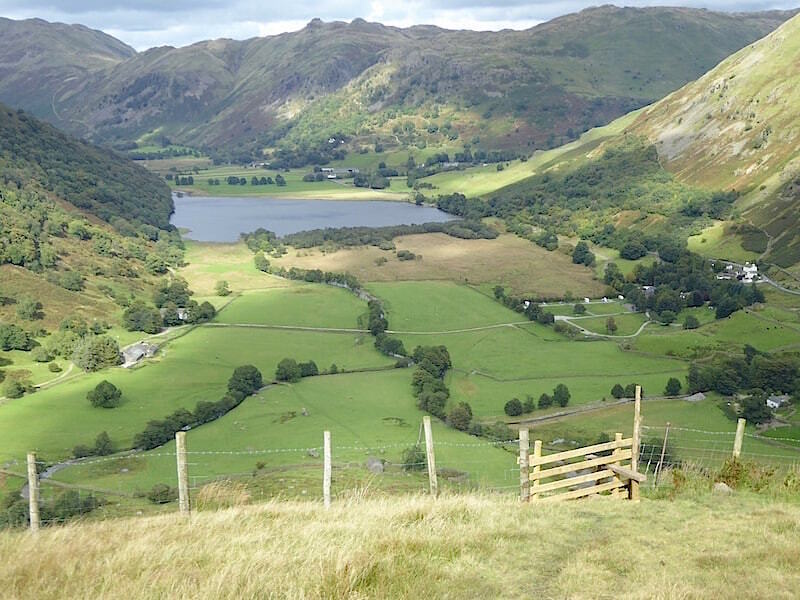 At just over eight and a quarter miles its not that long a walk but given the steepness of the Dovedale approach and the descent of High Hartsop Dodd our legs are happy to have reached the end of it. Perhaps a cup of tea will help to revive them, so we set off home to go and make one.